Oh, there are so many things "about me." So many. Too many things to even think about, really. I mean, where do I start? Back to the garden. 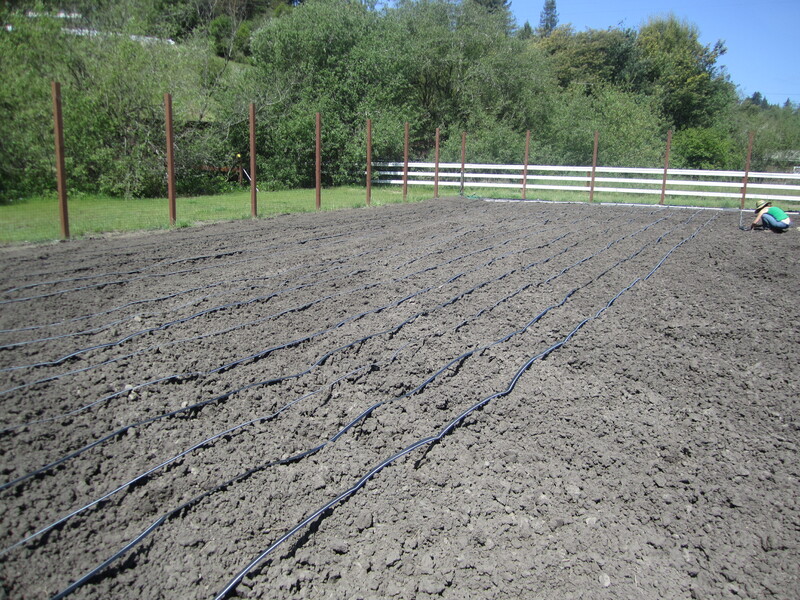 Now that the fence was finished (mostly), and the drip line installed, we had no more excuses – it was time to plant. But first we had to plan everything out in detail. I mean, one just doesn’t go about tossing seeds hither and thither and expect everything to pop up in nice groups, does one? 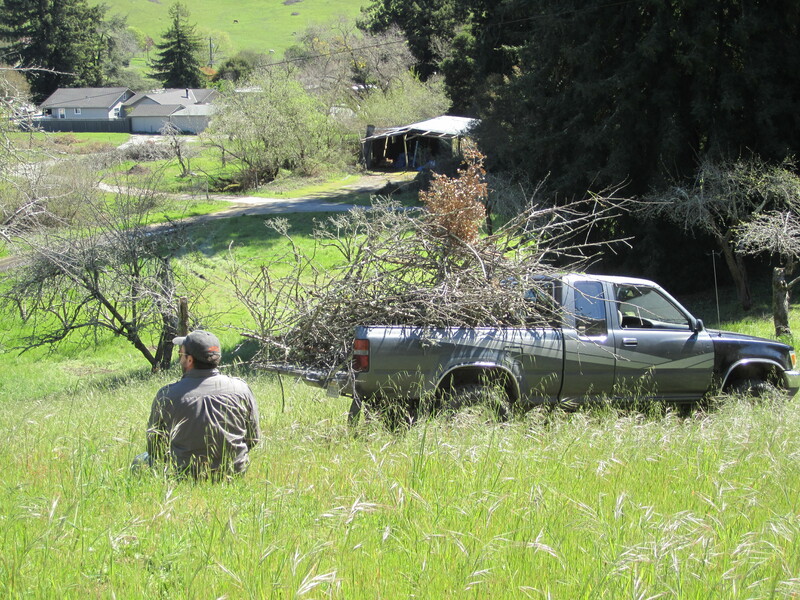 No, any respectable farmer must map every section out, according to group, and allow for walkways, space for compost piles, and a place to park the truck. 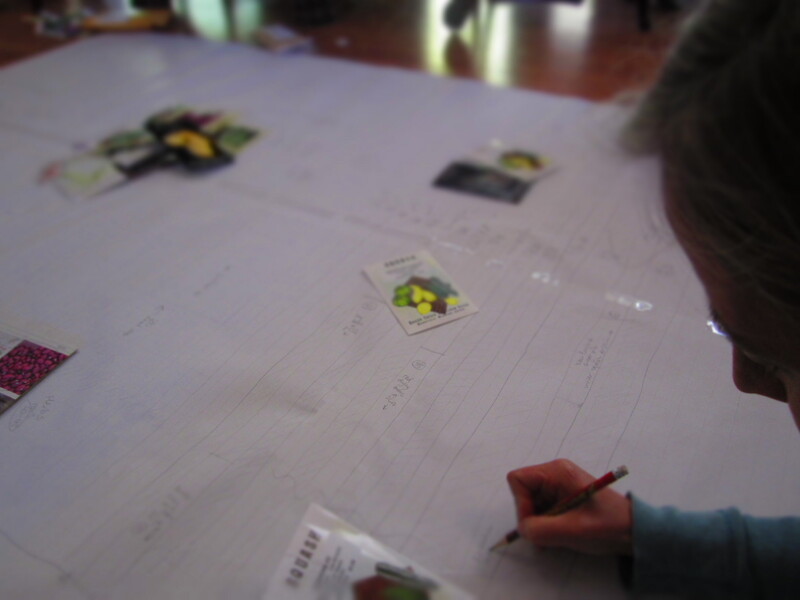 This we did on a huge piece of graph paper on the floor (plan the garden, that is – not park the truck. That would have been impossible). 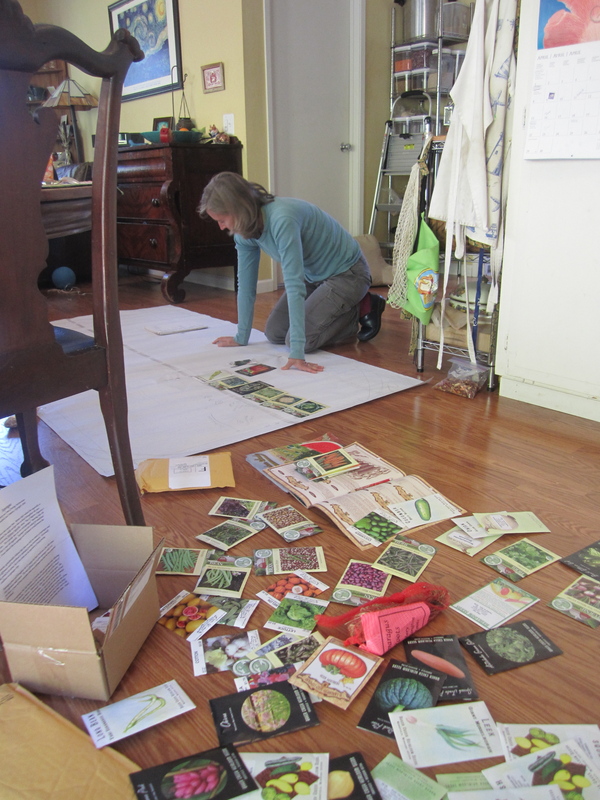 We had already received all of our seed packets in the mail (from three separate seed companies), so we picked a morning, laid everything on the dining room floor, and got to work. This took some doing, but after a couple of hours (and a lot of erasing) we had a pretty good garden mapped out. 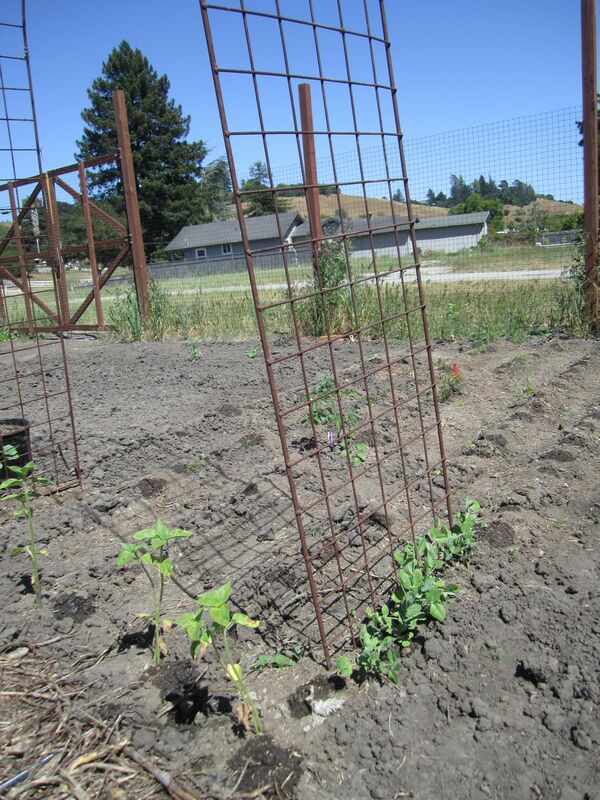 The seeds were bunched by group, or family: brassicas (broccoli, kale, etc. 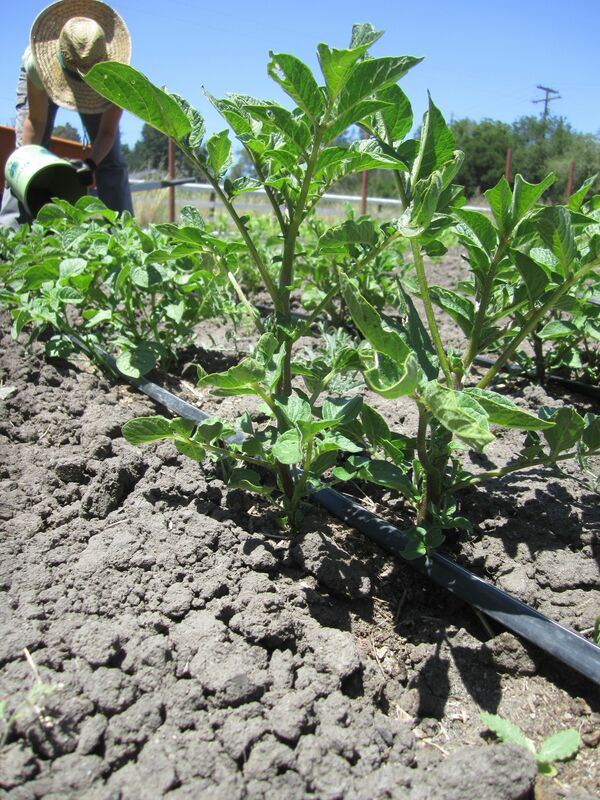 ), solanaceae (tomatoes and potatoes), legumes, roots, and some miscellaneous. 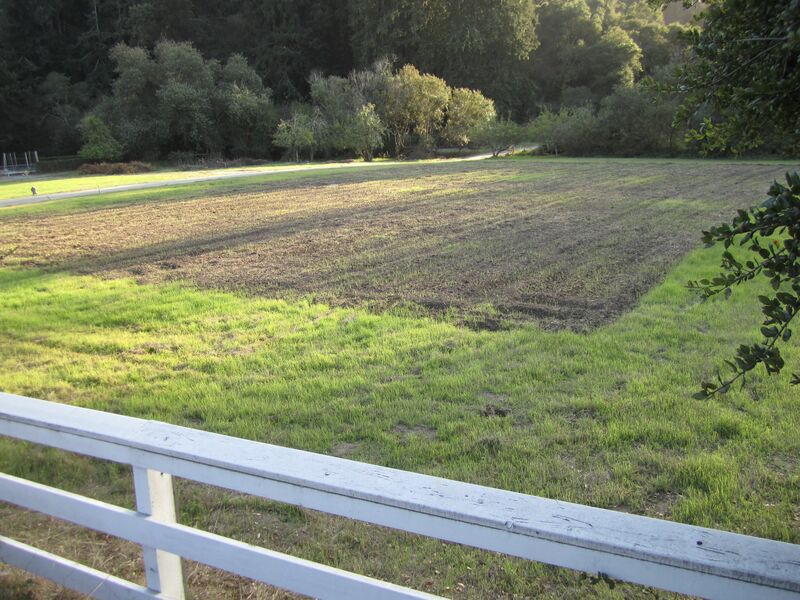 That actually left us with room to spare, which will come in handy next season as we’ll be rotating all of the crops. And what were we planting? I guess just about everything. 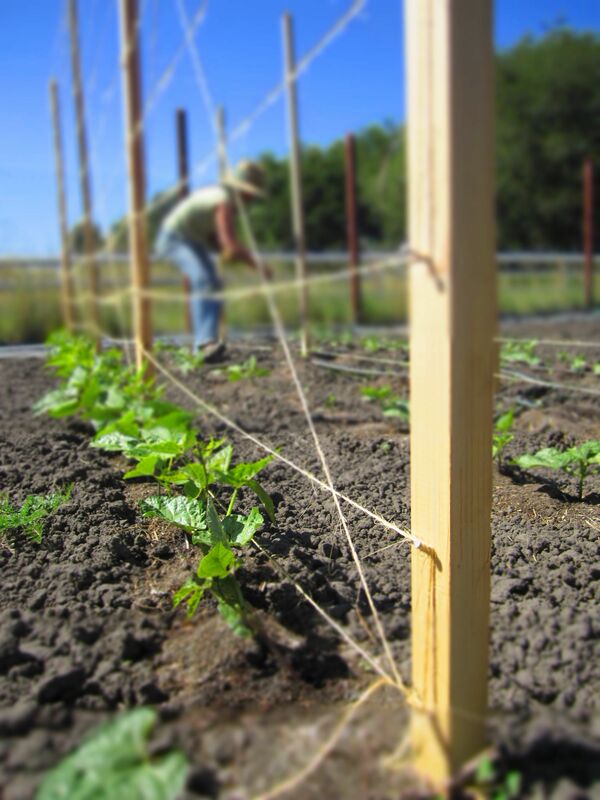 Here’s the list, in alphabetical order: artichokes, asparagus, beans (fresh and drying), beets, broccoli, Brussels sprouts, cabbage, carrots, cauliflower, chard, collards, corn, cucumbers, fennel, garlic, kale, leeks, lettuce, okra, onions, parsnips, peas, peppers, potatoes, pumpkins, spinach, and squash (some yellow summer and a variety of winter, including pumpkins for Halloween). Add to the list an herb garden with all the goodies and a tiny garden for Sarah to grow her own cherry tomatoes, watermelon, carrots, sunflowers, cukes, sweet peas, and cotton. 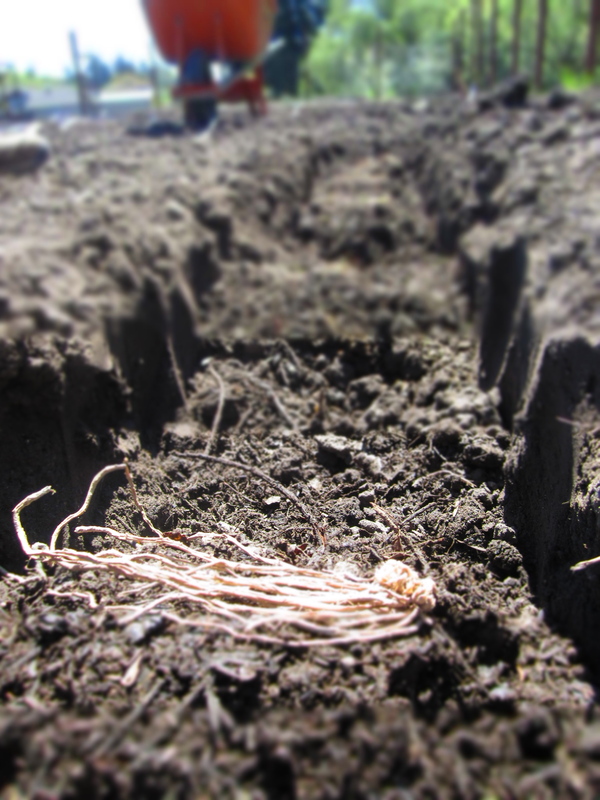 Now that the planning phase was over, it was time for sowing. 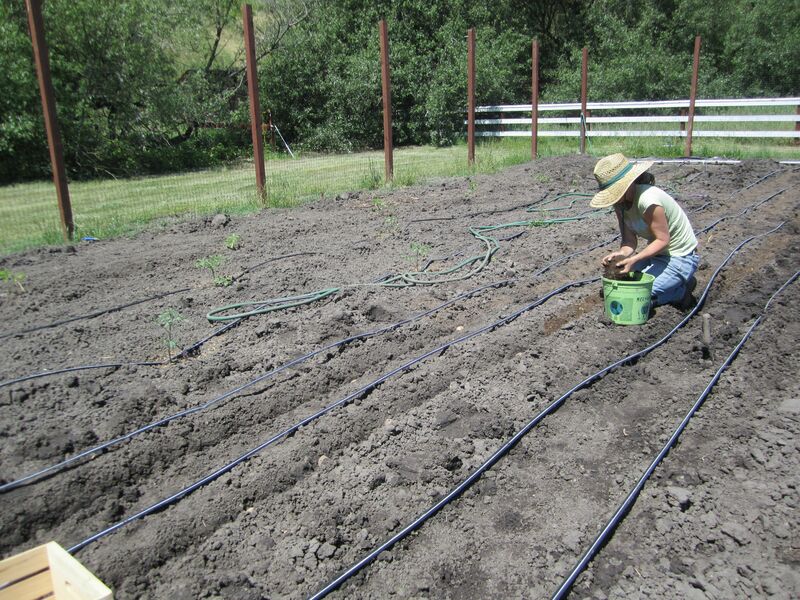 The tomatoes and peppers were starts, and the potatoes were, well, potatoes – but otherwise everything else was in seed form, so we’d have to trench or cultivate each row before planting. 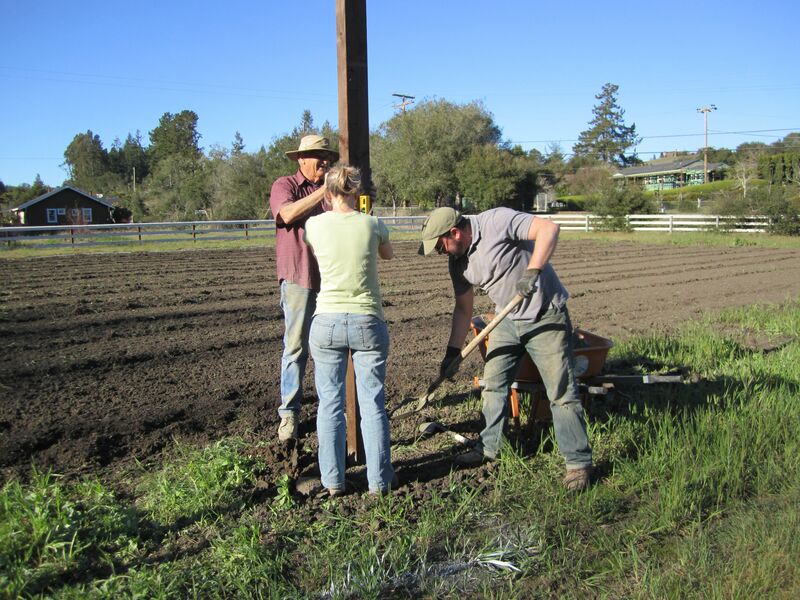 Unfortunately we had gotten a good bit of rain since the last time we tilled (before putting in the drip line), and what had been beautiful, dark, loose soil had turned, over the course of a couple of weeks, from a sticky mud pit to a hardened, unworkable crust. 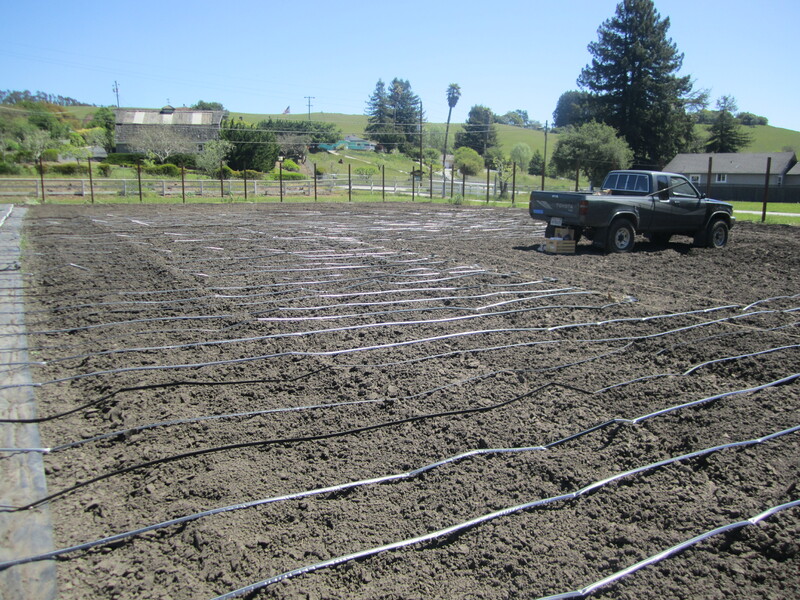 There was no way we could amend the entire site before planting, so we had to just go for it, forcing shallow gashes into the ground along the drip line and covering the seeds with the gravel-like lumps of dry clay. 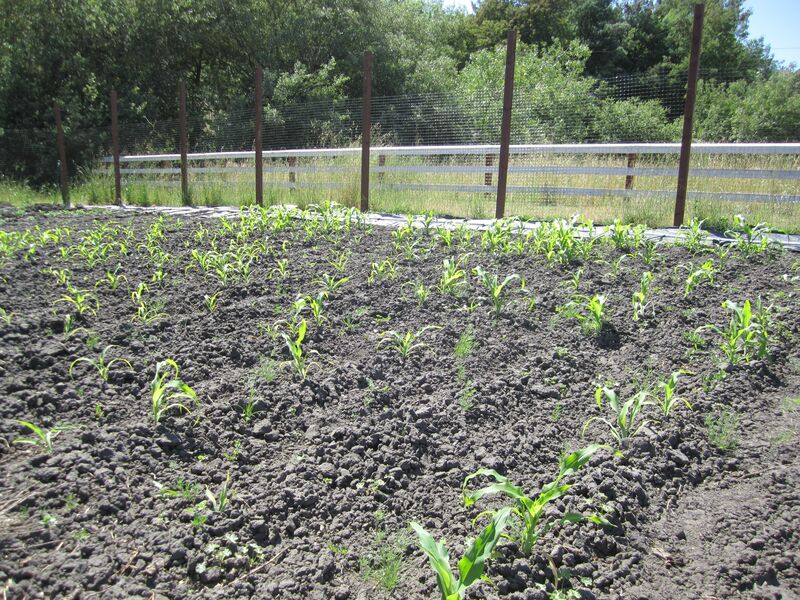 We were able cover some of our rows with a nice compost/manure mix, but most of the garden looked like the surface of Mars (you can see what I mean in the pictures below). 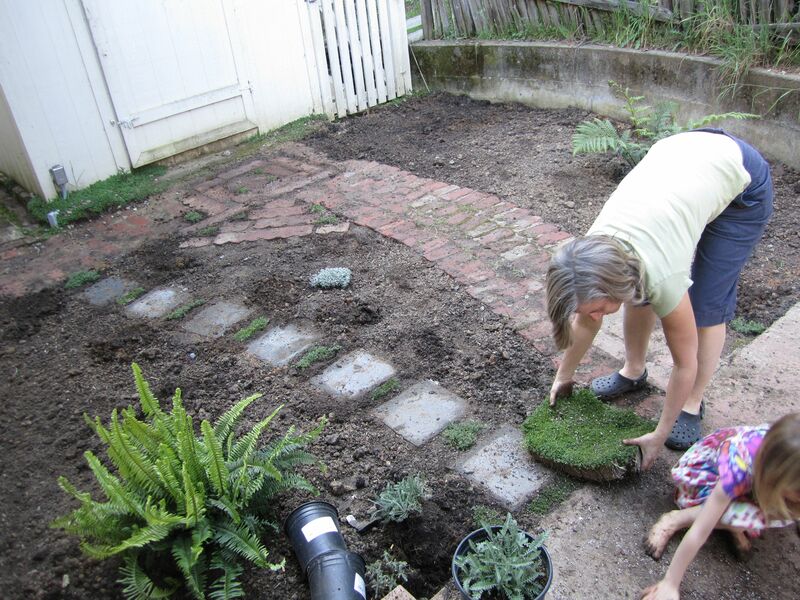 Which was damned discouraging, really, as the idea behind a garden this big was to have food – to eat, dry, can, store or sell – for the whole year, thus saving us valuable time we would otherwise have spent looking at US Magazine in line at the supermarket while the aromatherapist up ahead pays for her Kombucha with a check. 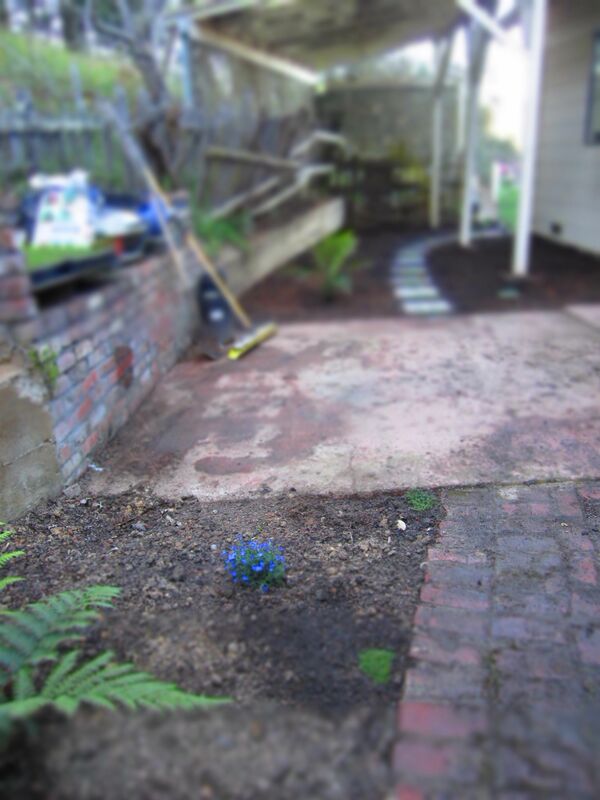 The notion that nothing would actually grow in our garden hadn’t occurred to us. But somehow everything seems to be coming up! The last of these pictures were taken a couple of weeks ago, so it’s actually in better shape than it looks here. 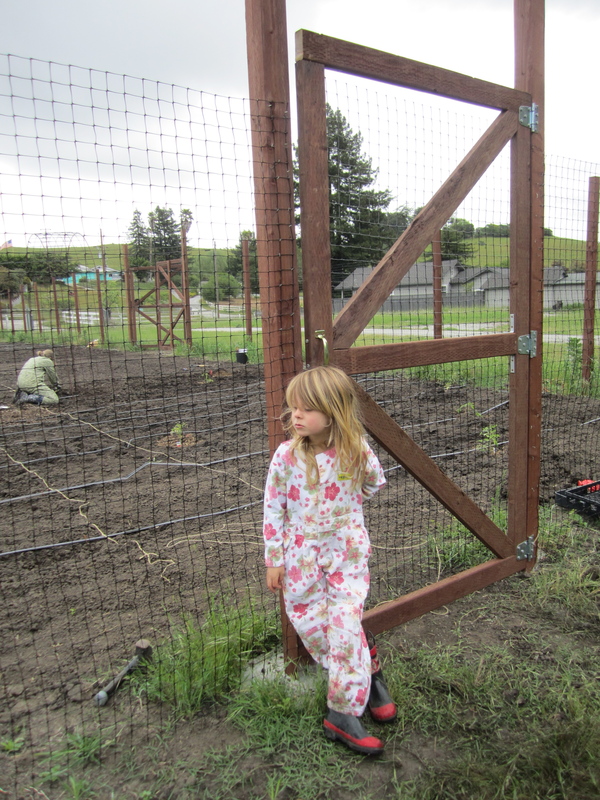 Lizzy figured out how to program the automatic drip timer, and we’ve even had to start weeding. It isn’t perfect, not by anyone’s definition: some sections seem extra dry while others flood a bit even with moderate watering. 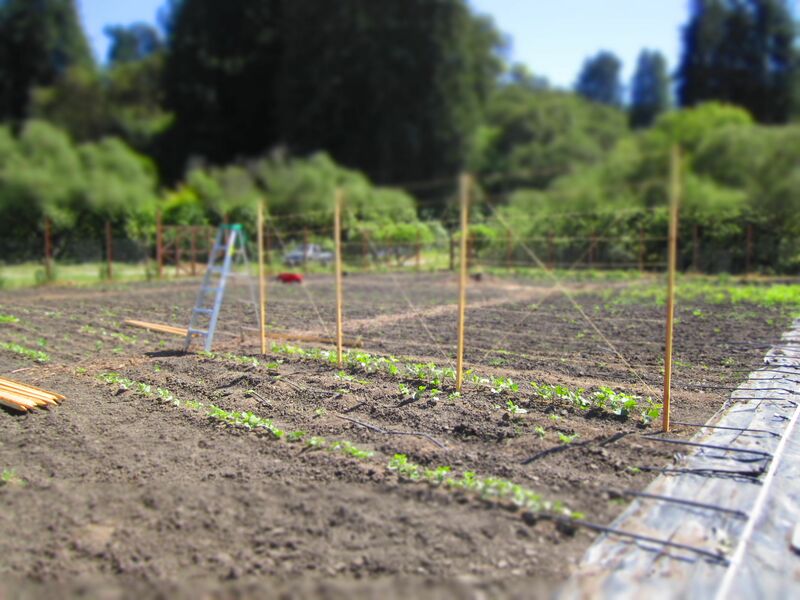 I still wince every time I look at the soil, and some vegetables, like the broccoli, cauliflower and kale, seem to be struggling. 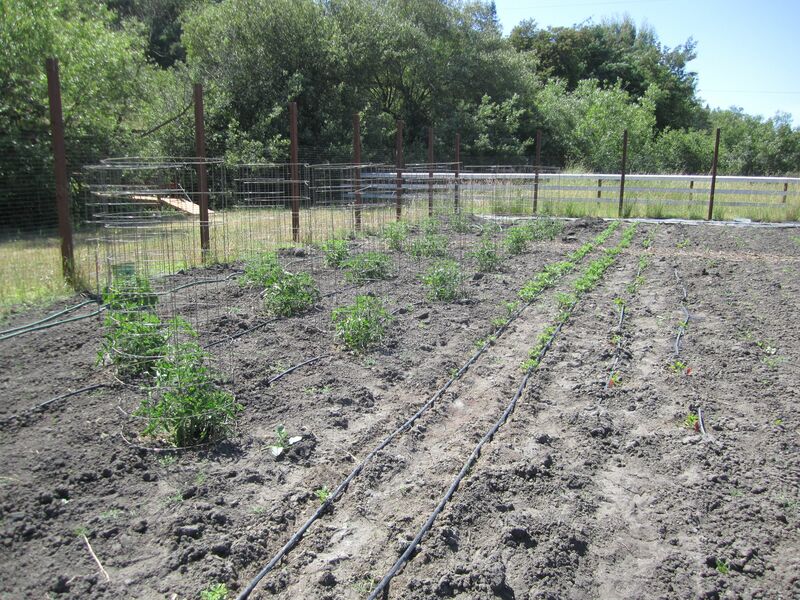 But others, like the corn, beans, potatoes, and – surprisingly – lettuce are thriving, and the tomatoes look great. It remains to be seen, of course, if any of these grow to fruition. Until then we’ll tend to them as best we can. 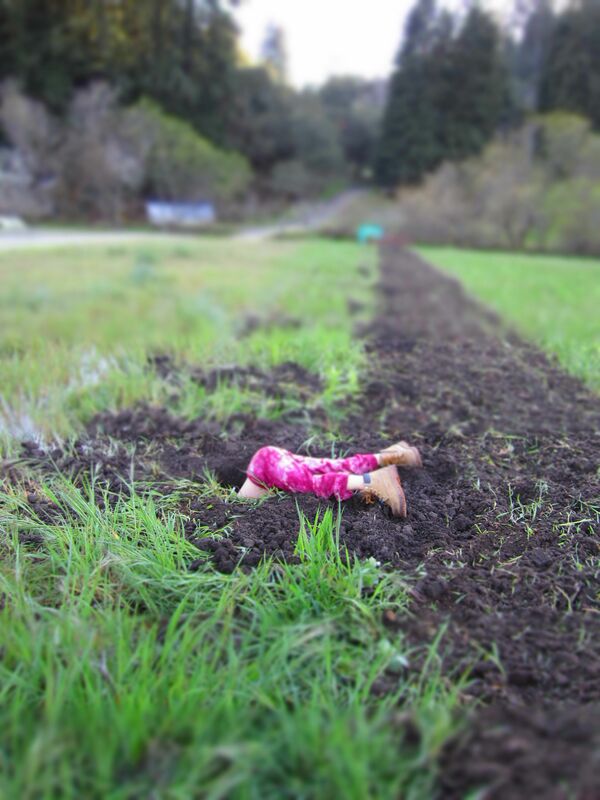 Now we just have to worry about the gophers…. So here is the chicken situation: we got 40 chicks, raised them, kept the hens for egg laying and processed and froze the roosters. Well, almost all the roosters: we kept one for breeding. His name is Lucky. Believe it or not, all of this went exactly according to plan. Well, almost exactly. We figured a “straight run” of chicks – a chance mixture of both sexes – would come out close to a 50/50 mix. But no. Once they started to grow out of fuzzball stage, we started sorting them out and we found we had 12 females and 28 males! Yikes! That was a little more processing than we had counted on. And fewer egg layers than we’d hoped for. 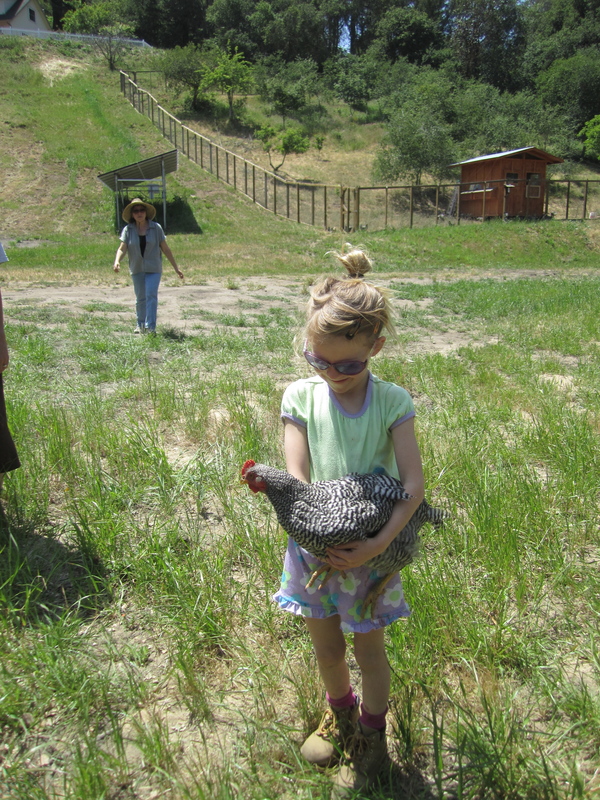 The other monkey wrench was our trip to Hawaii: we had it scheduled the day after the chickens turned 15 weeks old. 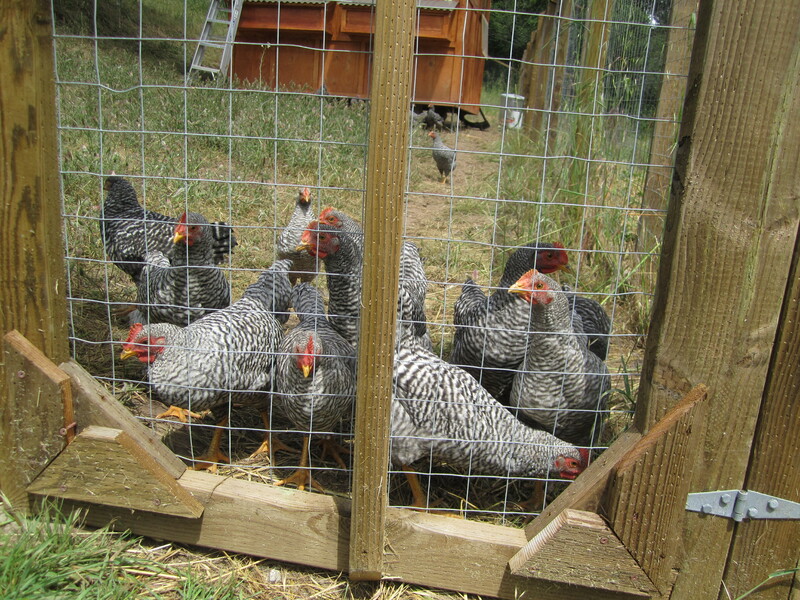 I read that our type of chickens, Barred Plymouth Rocks, should be processed between 15 and 20 weeks old. 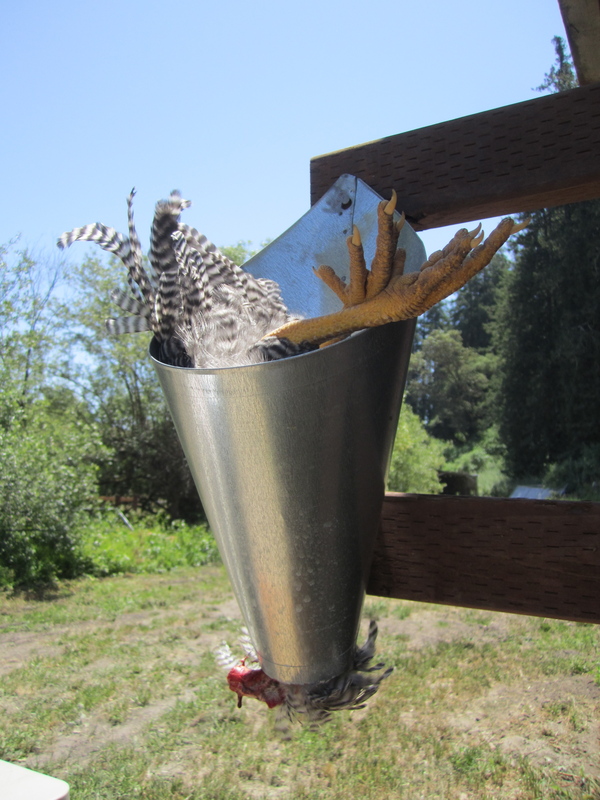 But I didn’t want the pet-sitter to have to deal with an unruly gang of fighting, crowing roosters. So, they all had to go – way ahead of schedule. We learned how to process from very nice strangers who responded to my request on an online chicken forum I belong to. 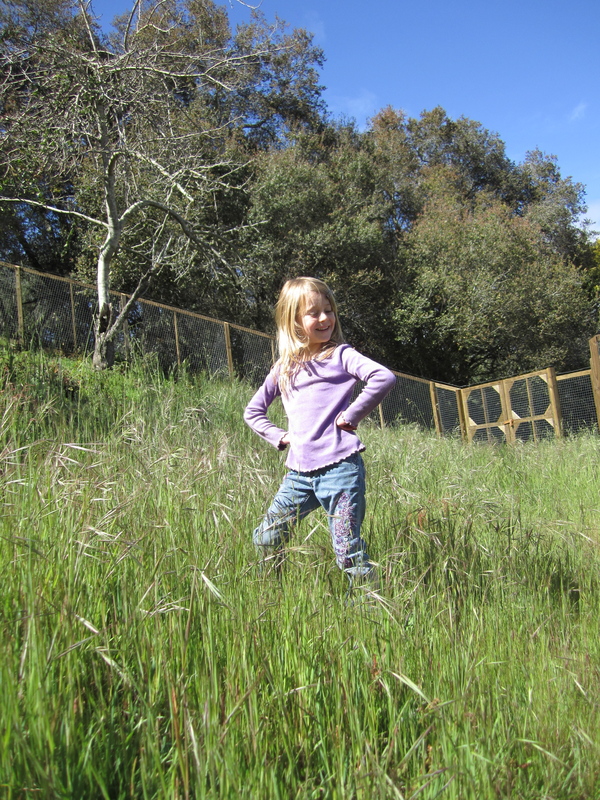 I asked anyone in the greater Bay Area if they wouldn’t mind teaching us how to process, and, by gum, someone offered! 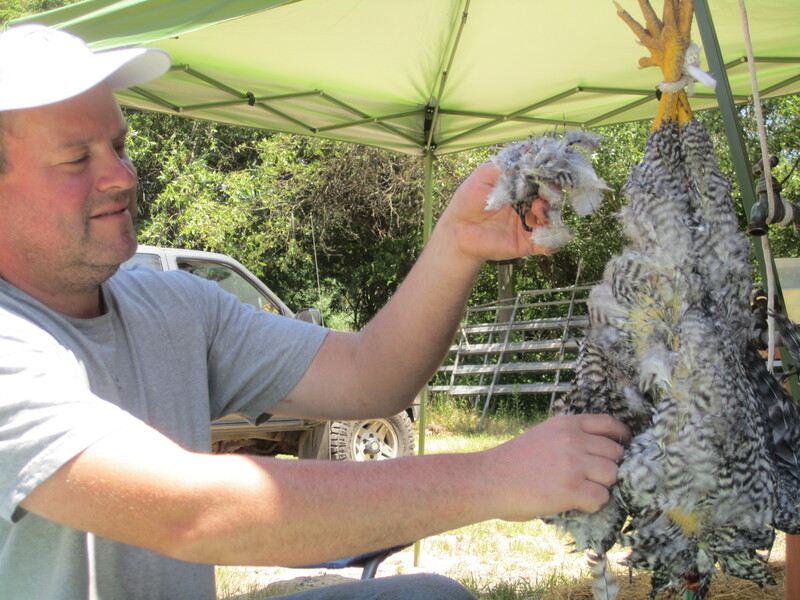 So, in November, we drove two hours to help people kill, pluck and eviscerate their chickens. We actually had a great time and even Sarah helped pluck! So, when it was time to do our own, we had some idea what to do. 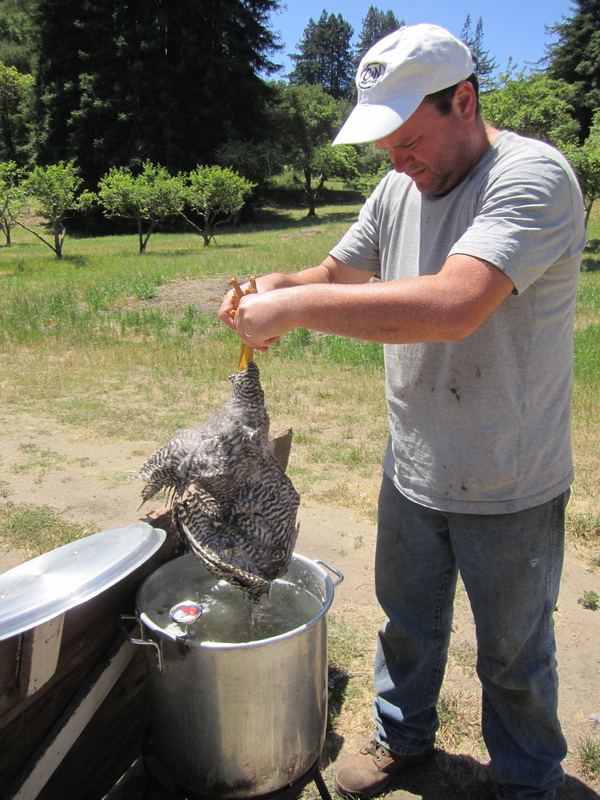 Turns out processing chickens is slow work, so we took them in batches. One day we did three, the next time we did six, after that we did eight, then just two (taught someone else how! ), and finally finished with another batch of eight. Here’s the rough idea: catch a roo, hold him by the feet so he is upside down (it calms them), put him in the “killing cone”, slit his throat and let him bleed out, wait for the shaking to stop, cut off the head (he is already dead), dunk in 145 to 150 degree water a few times, hang by the feet and pluck. Then remove feet and neck and eviscerate CAREFULLY. This takes some time. Plucking takes some time too. Equipment we used: a metal cone for killing, a wheelbarrow of straw to catch the blood, a propane burner and lobster pot for dunking (and a thermometer), a rope with slipknot for the plucking area, an outdoor sink for our evisceration station, a cooler with ice for finished chickens, and VERY SHARP KNIVES. 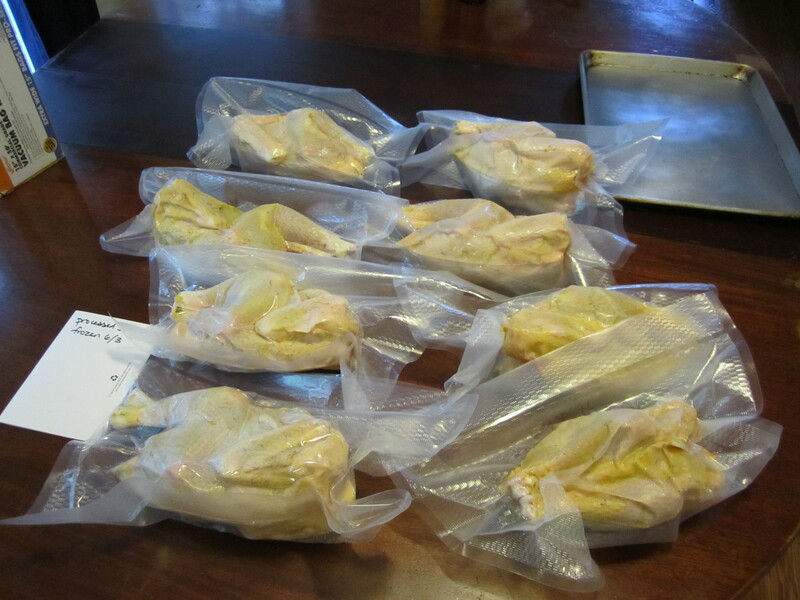 We also bought a good vacuum sealer for sealing up the chickens before freezing them. One thing we learned about freezing the chickens is that they need to rest in the refrigerator for three days before freezing, to go through rigor mortis. So, you can either process a chicken and then immediately cook it (before rigor sets in) or wait the three days and freeze it. So far we ate five fresh, gave one away, and froze 21. That might sound like a lot of chickens in the freezer, but keep in mind these were processed quite early, so they’re little. But they’re still yummy! Hello everyone! It’s been over a month since we last posted, but I hope you’ll forgive us as May turned out to be pretty busy. Not only did we have a garden to put in, chickens to process, acreage to mow and bridges to build, but we also took a brief trip to Yosemite (where we found ourselves in the middle of a blizzard), and were lucky enough to enjoy extended visits from both sides of the family. Now that the dust has settled, the mower has replaced the tiller (which had replaced the auger) on the Kubota, and the guest room is again fulfilling its natural role as the place where I watch YouTube clips all night while pretending to write, let’s pick up where we left off. …As well as a smaller, side gate. This in itself is remarkable as it involved the use of power tools and my somehow coming away from the experience with all of my limbs and digits intact. Anyway the plan was to have two small gates to go along with the larger one, but circumstances have prevented me from finishing – or, rather, even starting – that final gate. Consequently we’ve had to tear out the polypropylene at the posts where that gate should be in order to have access to the spigot near that end of the garden. Could an animal get in? 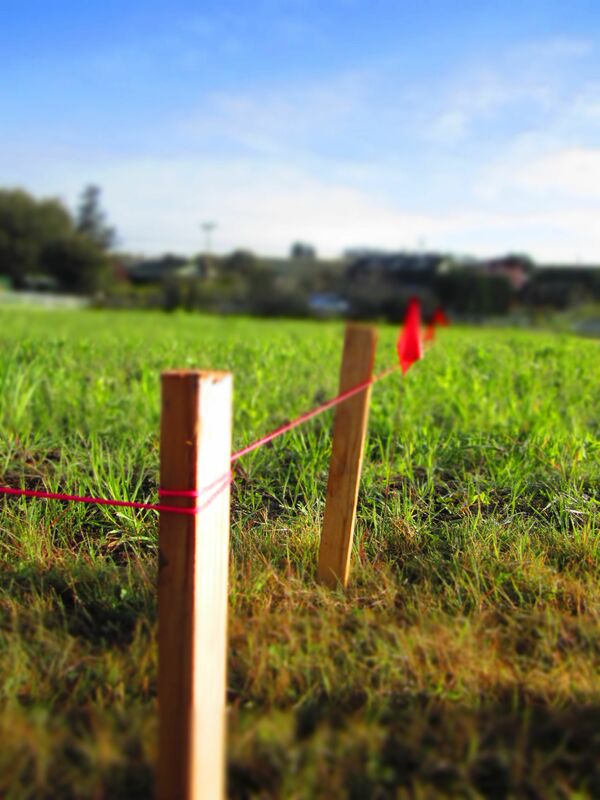 Perhaps, but quick thinking on our part seems to have solved that problem: when we’re not using that entrance we just drape the section of cut fencing material back between the posts as a ruse intended to stymie any deer, skunks or, if necessary, neighbors bent on breaching the perimeter. Ha! Humans: 1; Deer: 0! With that done it was time to move on to the drip tape. 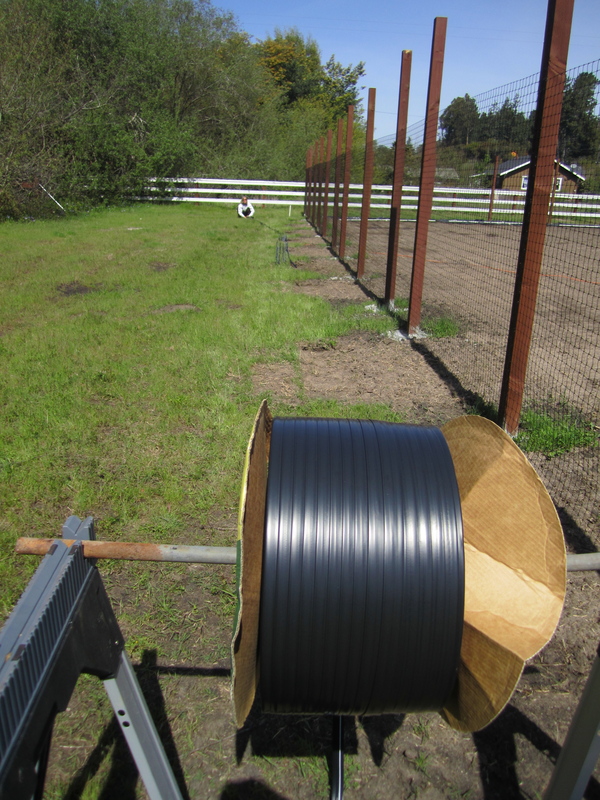 We had purchased one large, 4,100 foot roll, so we had to measure out each segment, cut them then roll them up, as tightly as possible, in order to carry them to the drip bars. This took longer than you might think; eight lengths of tape, at a hundred feet each, is nothing to sneeze at, and if you’re anything like me a strict adherence to method is required in order to avoid more work during the unrolling stage. I don’t know about you, but I can’t even roll up a garden hose without finding myself, only minutes later, struggling to untangle an impossible knotted convolution of rubber. Multiply that common experience by about a thousand and you’ll see what we were up against. But we got it done, and soon (actually, a couple of days later) each segment was attached to the main bars, rolled back out to full length, capped off and stapled down. Not that we haven’t been busy. 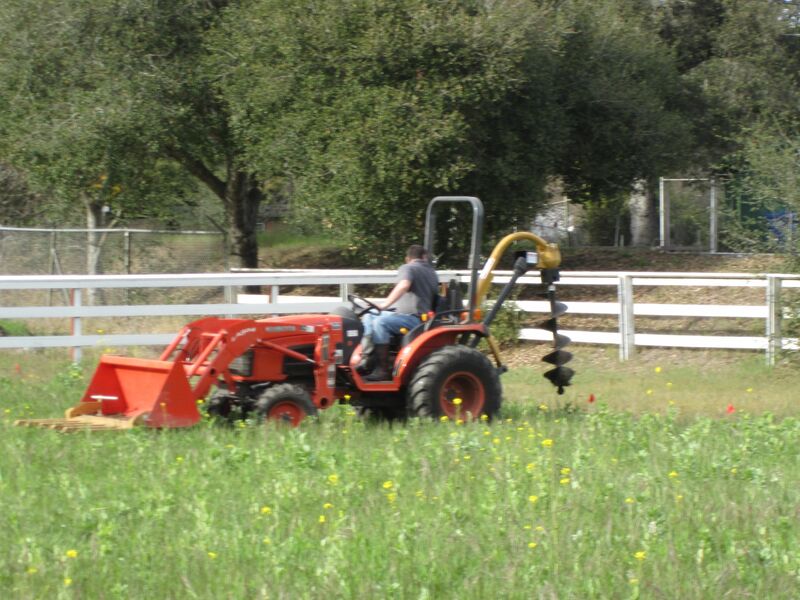 There’s mowing the whole property, for example, to be done. That in itself deserves its own blog posting as it involves me, on a tractor, nearly rolling down a hill to my death – but perhaps I’ll write about that another time. Here I think I’ll recount something less edge-of-your-seat, if a little mundane. When we moved onto the property the house had many of the trappings of your typical rental (which it had been for a couple of years): monochromatic interior painting, wall-to-wall shag carpeting, fist-holes in the dry-wall, the unmistakable smell of urine wafting about the rooms – you know, just like your last rental. Of course, it’s not a rental any more, but with all the things we’ve been doing outside of the house, beautifying the inside hasn’t been a big priority (although we did tear up all that carpet). 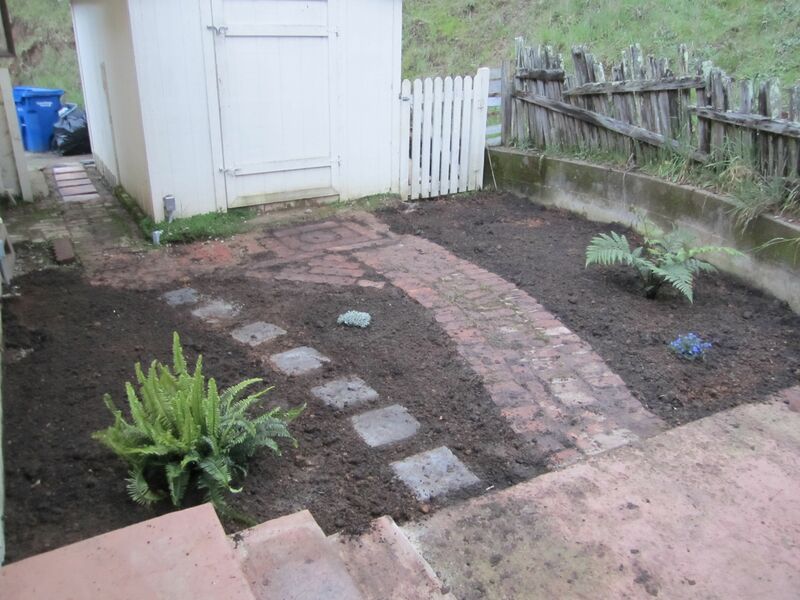 We were, however, able to devote some time to the back yard. Now, maybe yard isn’t the correct word, since that implies grass; step outside our back door and you’ll find yourself face to face not with the green stuff Walt Whitman used to get so loopy over, but with (again, in accordance with the rules governing rental properties) lots and lots of gravel. Now admittedly there isn’t a lot of square footage here, but it’s still an area we’d like to utilize. There’s a built-in fire pit at the edge, with plenty of room for a few lawn chairs. 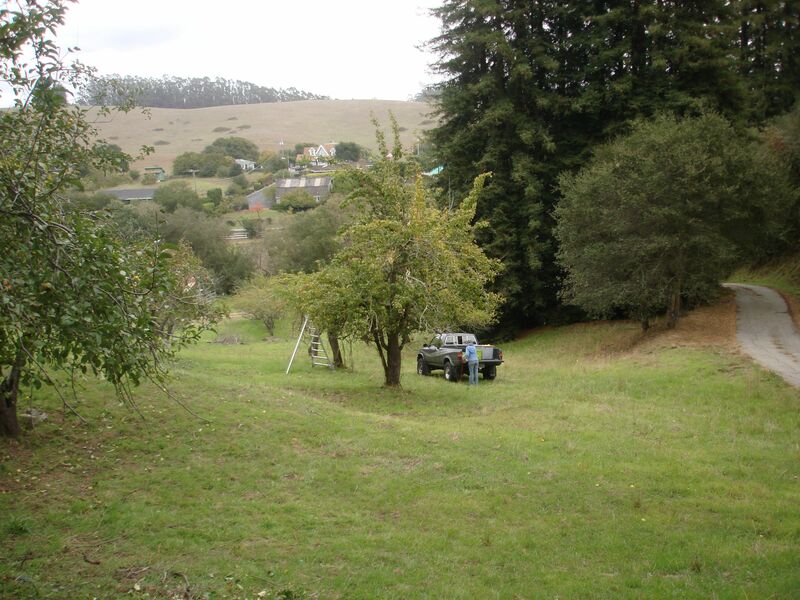 We can press our cider there, barbecue with friends, get mauled by bobcats – the possibilities are endless. There’s even a rickety, corrugated awning-thing for shade. In short, this ugly patch of crud could actually be something. 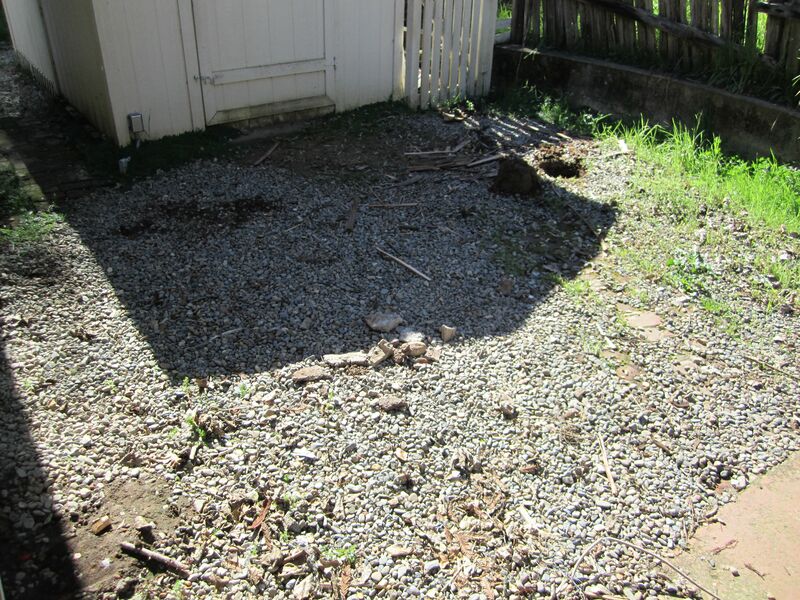 So a couple of weeks ago, while we were waiting for our drip-lines to be installed in the garden-to-be, we had all the gravel shoveled out and dumped in the driveway. Then we hit our local landscape supply store and got to work. It turns out gravel would be the least of our problems: underneath that was a layer of rust-colored volcanic rock. Of course by that I mean the stuff you can buy at a landscaping store – not, you know, a natural layer of volcanic rock (that probably goes without saying as everyone knows that there is no actual lava along the Central California Coast – just lava lamps). Anyway, we got the volcanic stuff out and underneath that was hard, packed, clay-like dirt. 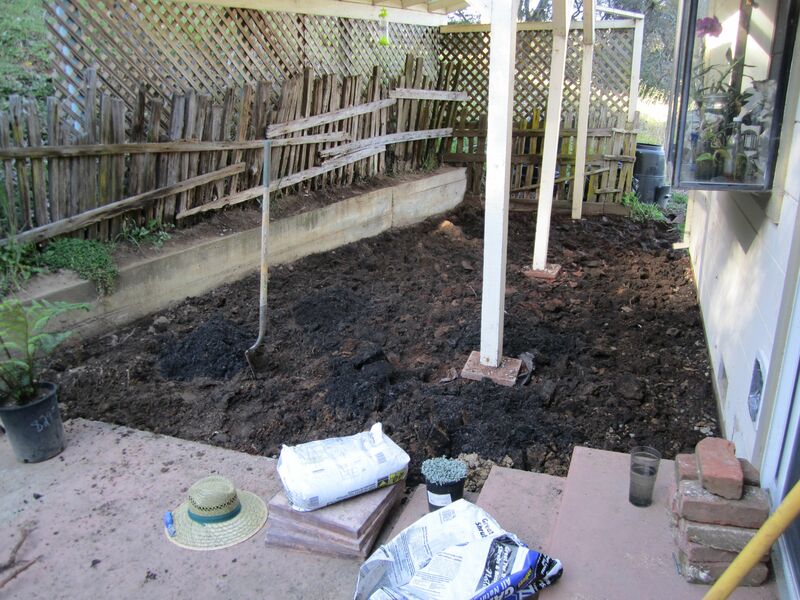 It took a lot of tilling to break that stuff up. 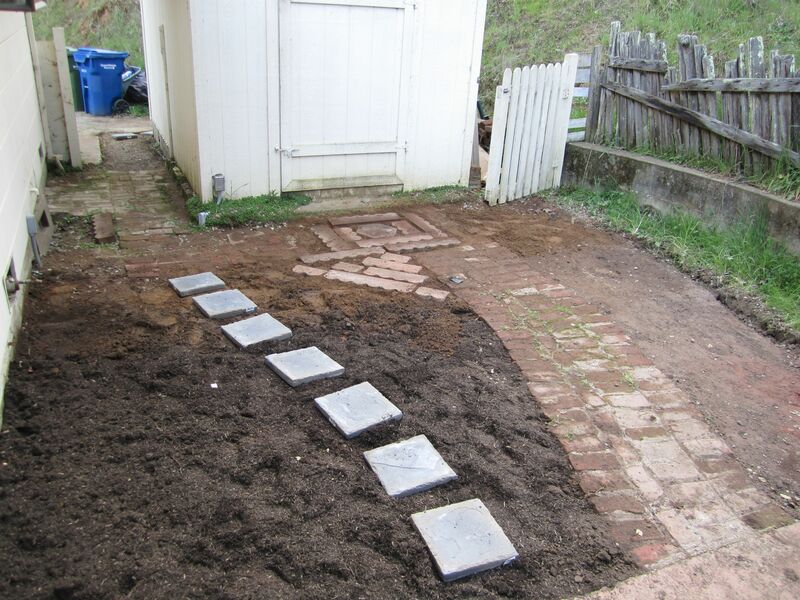 Once that was done we had to blend in twelve or thirteen cubic feet of topsoil, then set flagstone in sand for a nice path. I think it looks pretty good now. Once we finish planting the ground cover (there’s still a few flats sitting impatiently by the fire pit) and enough time has passed to allow it all to fill in, it should be a nice little bit of Eden. We finally racked our last batch of fermented (hard) cider last week. All in all it was a pretty good first season, considering we had a surplus of apples and, initially, no clear idea what to do with them. 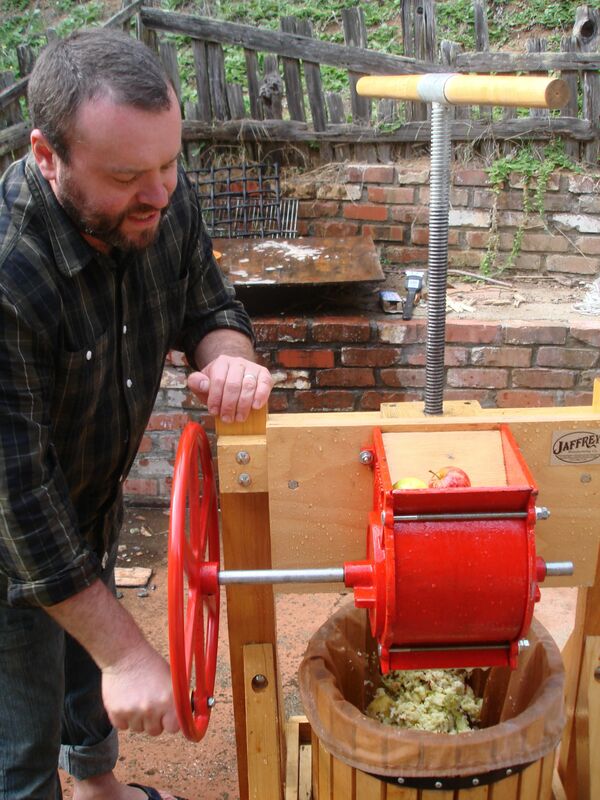 At first we just assumed we’d be making plain old cider. Fortunately, we have the perfect mix of varieties for the job: Red Delicious for sweetness, Newtown Pippen for tartness, and Bellflower for, well…okay, I don’t know what the Bellflower contributed. I’m sure it added something, though. At the very least it looked cool next to the others. There they are in the above picture. That’s the Bellflower on the left. It’s a softer apple, easily bruised, with lemon-yellow skin and an oblong shape. 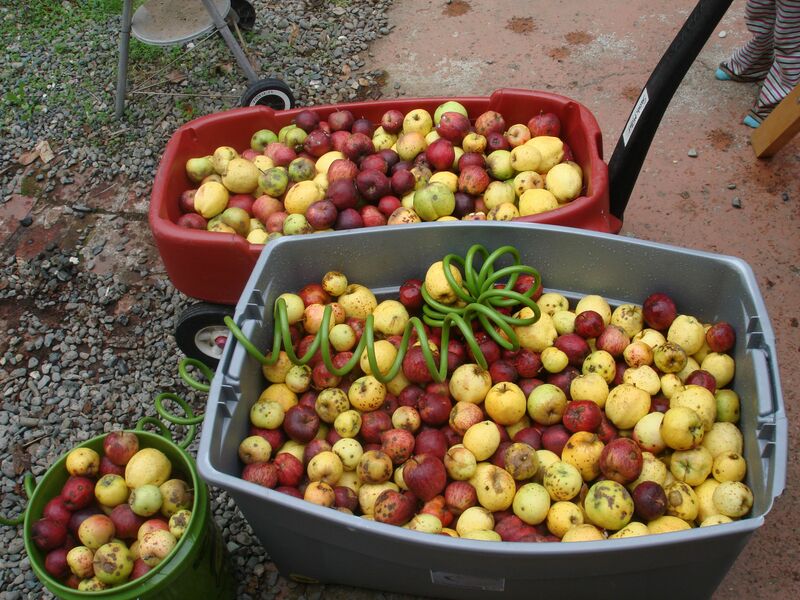 Generally speaking an afternoon’s picking would fill a trash barrel and then some. I think that we went apple-picking four or five times over the course of the season. 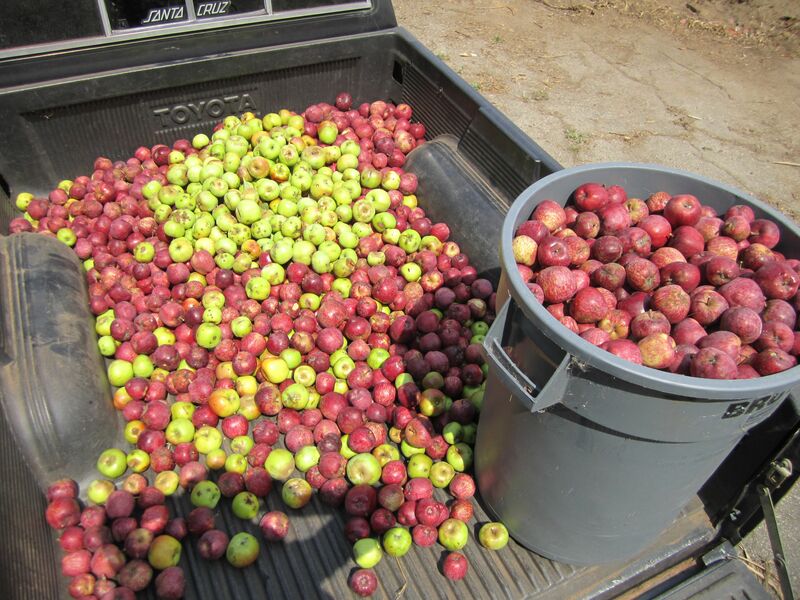 Ultimately we wound up with maybe thirty gallons or so of fresh pressed apple cider – and that’s after tossing apples that either failed to live up to our low standards of edibility or went bad in the lag time between picking them and pressing them (sometimes we’d pop a few bushels in water and then not get to the pressing for a couple of weeks. Oops). Neighbors were kind enough to give us a bunch of clean, empty gallon jugs for storage. We also bought a couple dozen gallons of spring water just for the containers. Most of the gallons went straight into the chest freezer. A few we gave away to neighbors or contractors, and, of course, we drank a couple ourselves. That still left a lot of cider. What to do with it? Well, turn it into booze of course! 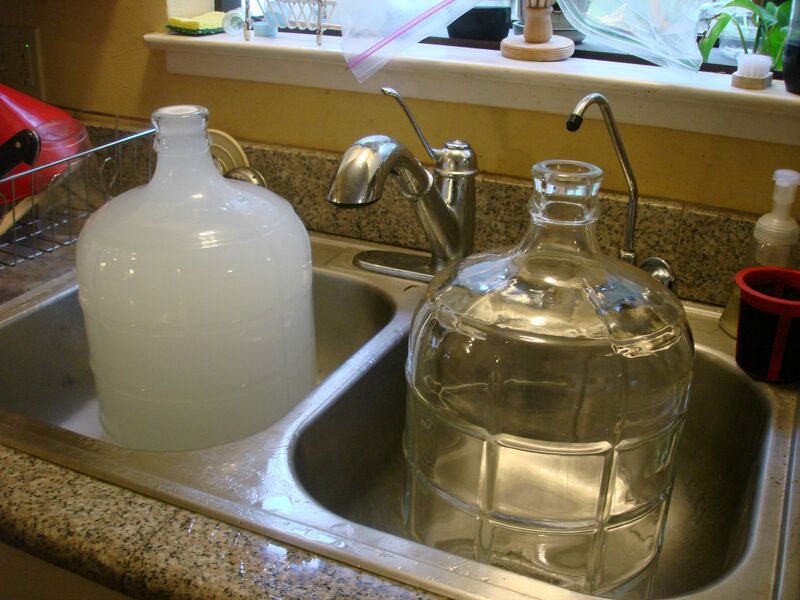 The tricky part is sterilizing everything before getting started. 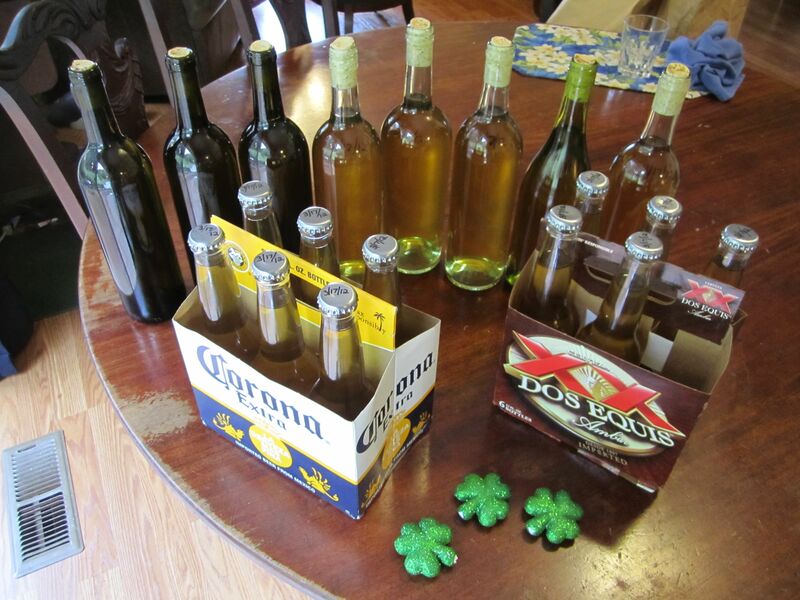 That includes not only the fermentation tanks (called “carboys”) and measuring equipment but also the washed Corona and wine bottles we had set aside for the bottling (though those wouldn’t be necessary until much later). Apparently keeping everything sterilized is a pretty big deal. 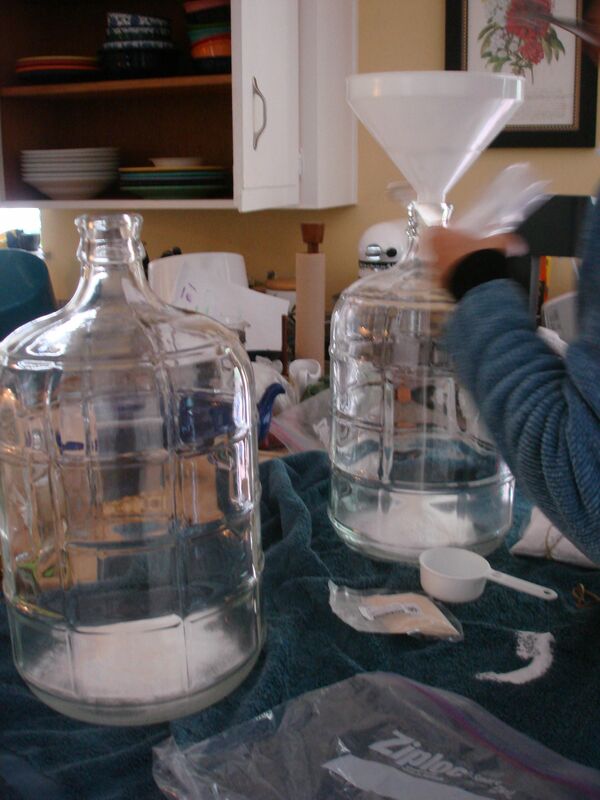 Once the cider, yeast, and sugar are mixed up and funneled into the carboys it will sit for several weeks. You can imagine, then, how any small impurity, microbe or germ could contaminate the whole jug and sicken the heck out of any poor soul who has the misfortune to drink it. Anyway, Lizzy measured out the sugar while the yeast was blooming in a dish of warm water. We also added yeast nutrient (probably not necessary, but we figured it couldn’t hurt), and pectic enzyme (this breaks down the pectin, which can become cloudy as the alcohol level rises). When Lizzy was finished with the measuring we added the yeast mixture and funneled fresh cider into the tanks. Then the carboys were fitted with special rubber plugs, into which were embedded plastic air-locks. The locks allow the gases to escape while keeping any airborne impurities from getting in. Floating on a small bit of water or vodka (which is sterile) inside the air-lock is a tiny plastic cap that bobs up and down with every rising bubble. This process, while fun to watch, is notable for another, more important reason: the yeast is converting the sugar to alcohol. Yippee! The fizzing and bubbling lasts only a few days. After that the trick is to just be patient and let the stuff sit – it’ll take a few weeks for the scummy solids (called the Lees) to settle into the bottom of the carboy. 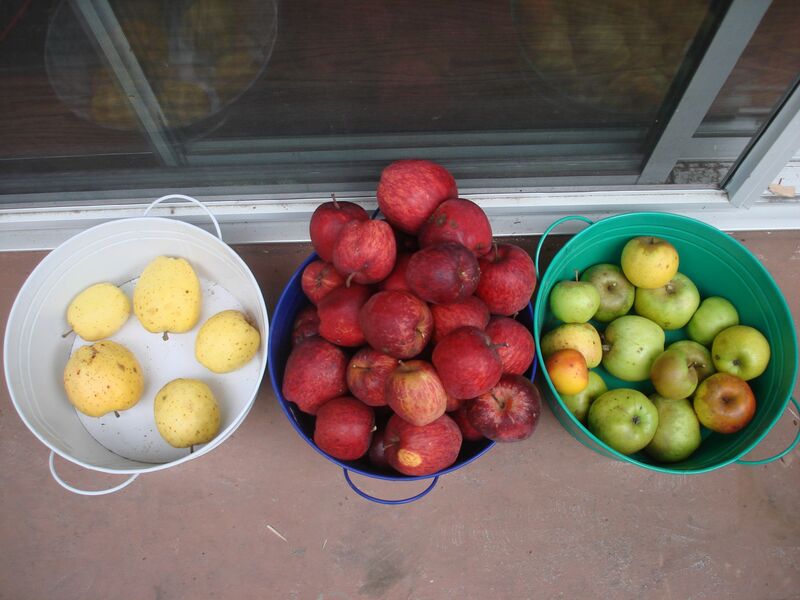 The cider on top will be clear, with only a bit of color. At this stage it’s not unlike white wine in both looks and, surprisingly, taste. Then it’s time to rack. 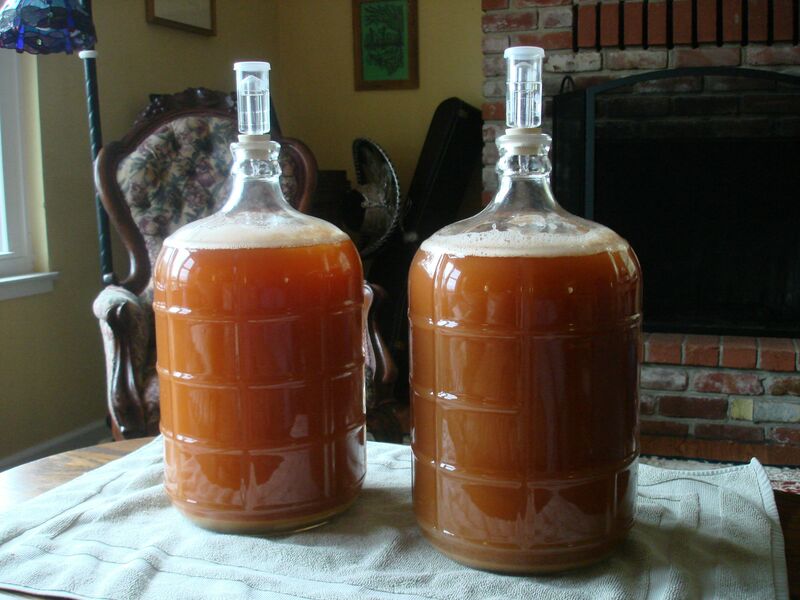 Racking basically means siphoning the clear, alcoholic cider into cleaned and sanitized bottles. Now I don’t know about you, but while I’ve often heard or read about people siphoning gas out of someone’s car I’ve never really done the thing myself. Frankly, it seemed pretty complicated. 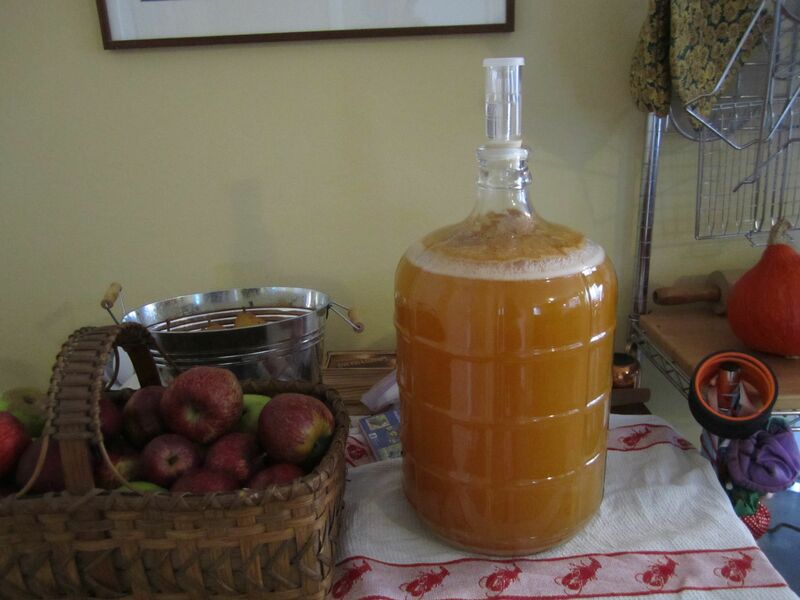 In truth it’s as low-tech as you can get: you put the tank of cider on a counter top, lay out your empty bottles on the floor below, stick one end of a rubber tube in the carboy on the counter and the other end in a bottle, and let gravity do its thing. Of course the bottles have to be capped and corked. 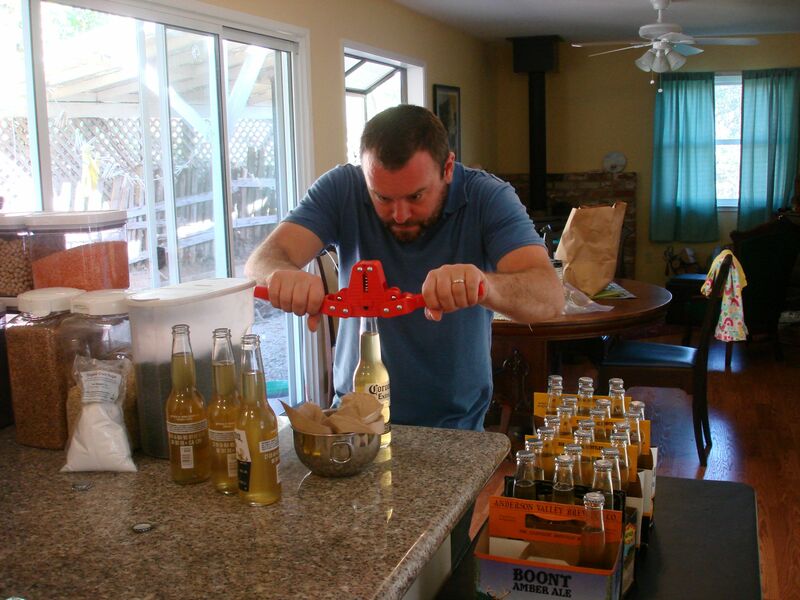 We got our cappers and corkers at the brew store and they’re pretty cheap and easy to use. 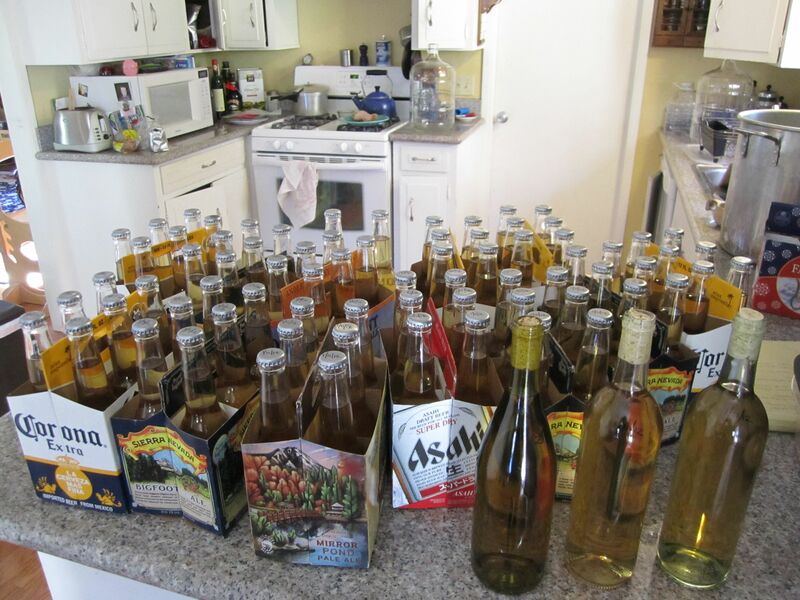 …you get a lot of cider. But it’s not as if we can start cracking these suckers right off the bat – no, it all goes into a cool, dark place to age for at least six months. We’ve tasted a couple of bottles (to make sure something dreadful hadn’t occurred), and they definitely improve with age. Our first batch was racked in October, so we’ll be drinking some of them soon. I can’t wait! What a great day we had today! It was sunny and warm, and we got a lot done on the land – but I also totally scored at Goodwill. Sometimes, the Goodwill gods shine down upon me, and today was one of those days. I got: practically new snow pants for Sarah, snow boots for Sarah, foul weather boots for me, lots of shirts for me and for Sarah, sweaters for me and even a parka! This is all in preparation for our trip to Yosemite next month, during Spring break. 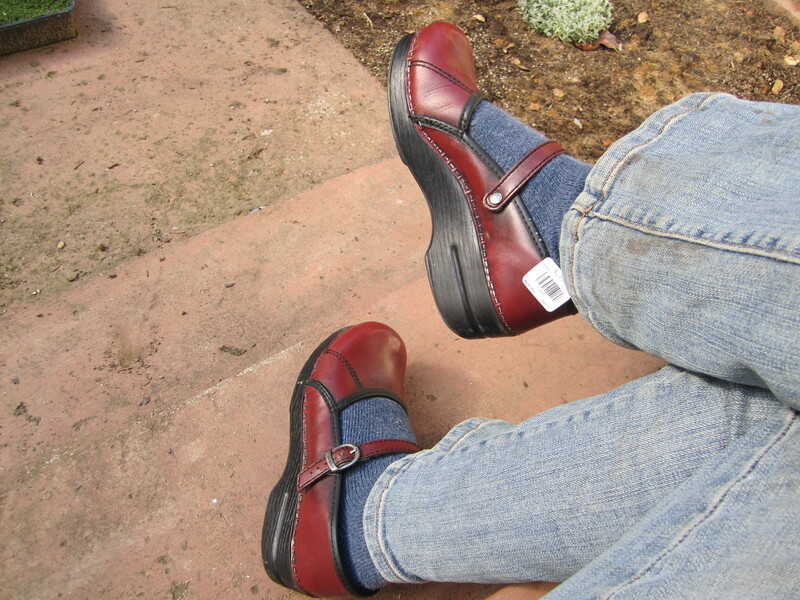 But the best deal of all was a pair of Dansko clogs – the only shoes I will wear – which retail for $125 new. Guess how much they were? Five dollars and twenty-five cents. And here is the burn pile, currently. Actually, it’s the burn staging area since that would be too much to burn at once. 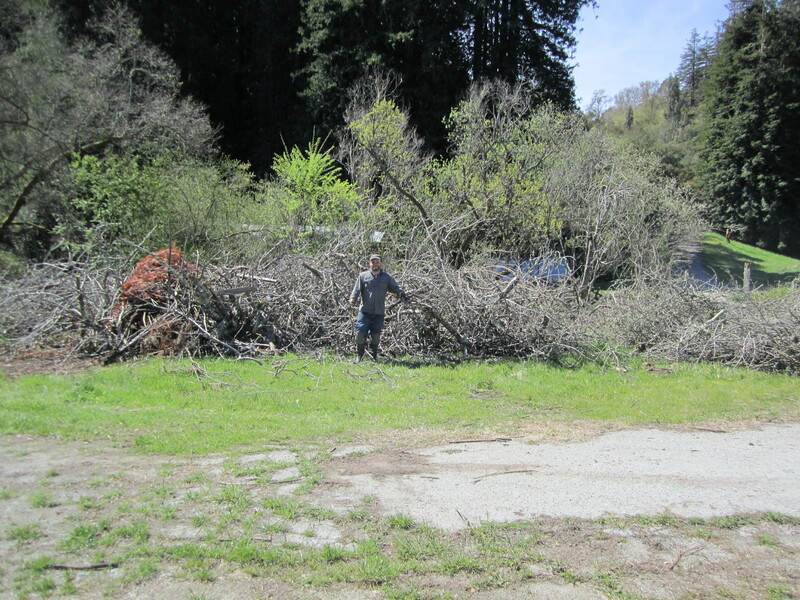 Keep in mind there is also a giant oak tree we took down (not in photo) that is partially chainsawed apart and also needs to be burned. 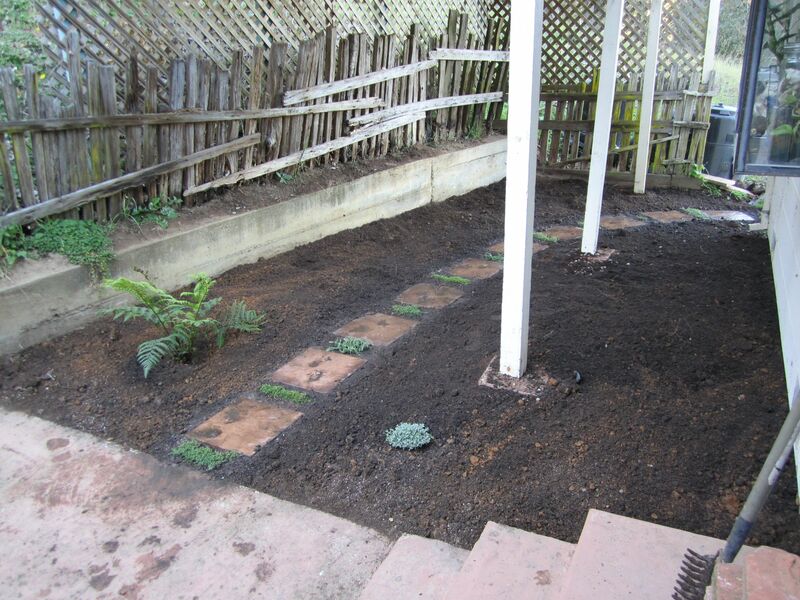 That done, we worked some more on putting up our garden fence. 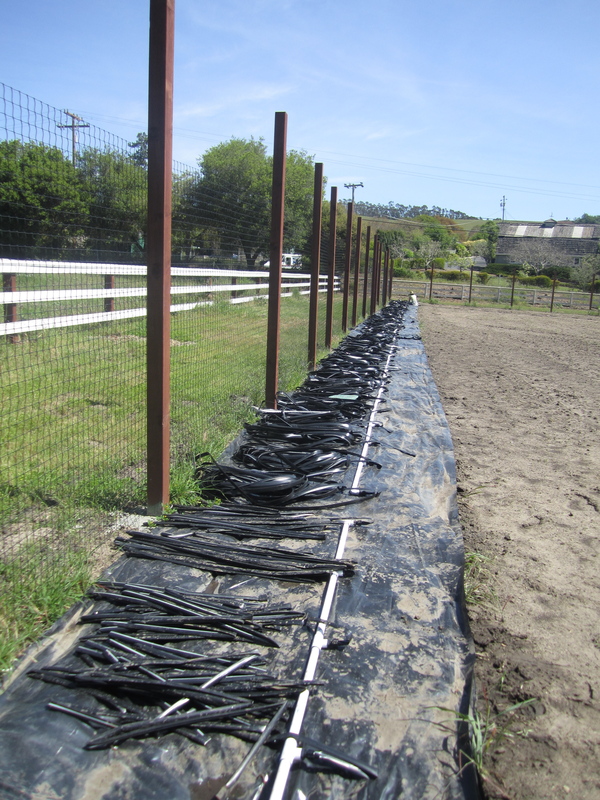 We have already put up the 58 ten-foot-tall posts and now it’s time to wrap them with fencing material. We got maybe 1/4 of the way done today. The brown house on the right is our neighbor’s house. Ours is the white one barely visible in the upper left. 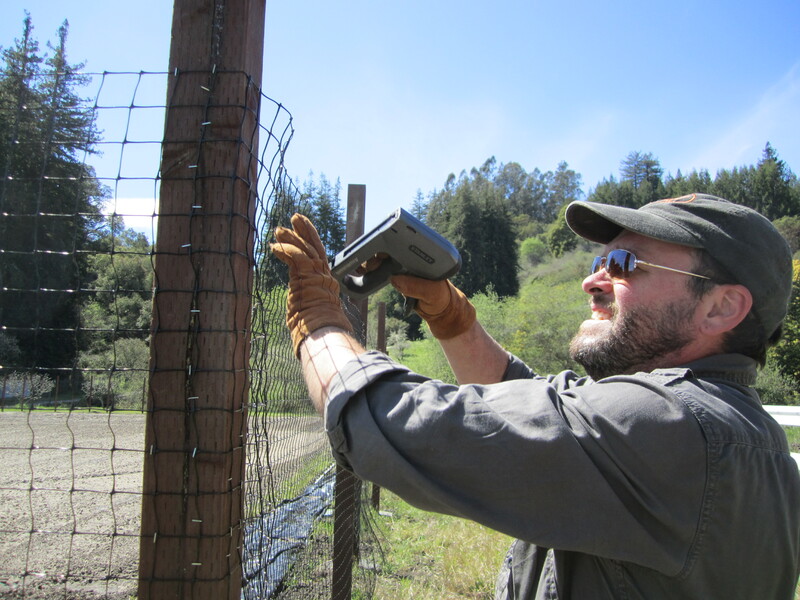 Anyway, Jason stapled while we both pulled on the fencing, and then I hammered the staples in more tightly. 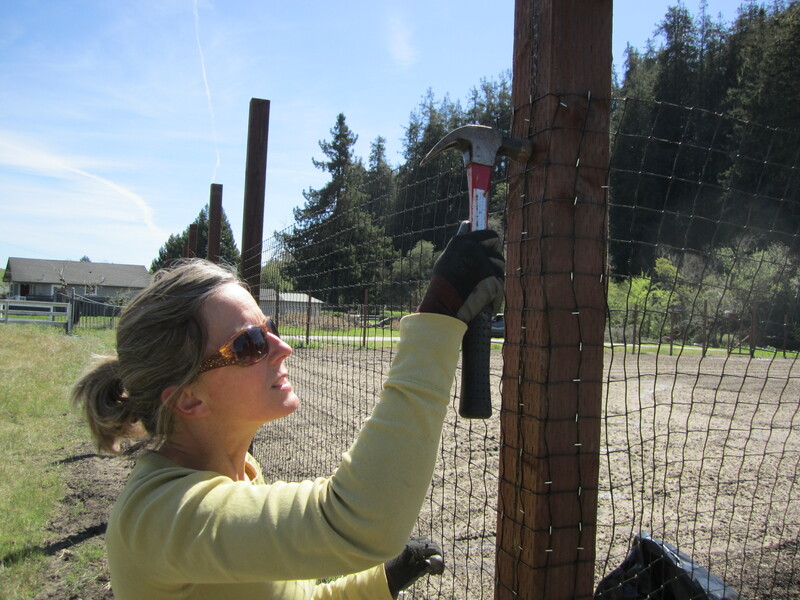 We had to watch out that we didn’t pull the fencing too taut, because it was bending the posts! Well, that’s it for today. Happy Spring, everyone! It’s been pouring rain here the past couple of days, which gives me the perfect opportunity to tell you all about our latest project. I know – that doesn’t sound like much, but for us it marks a milestone. It’s the first major project that we’ve undertaken ourselves, as opposed to hiring a contractor. 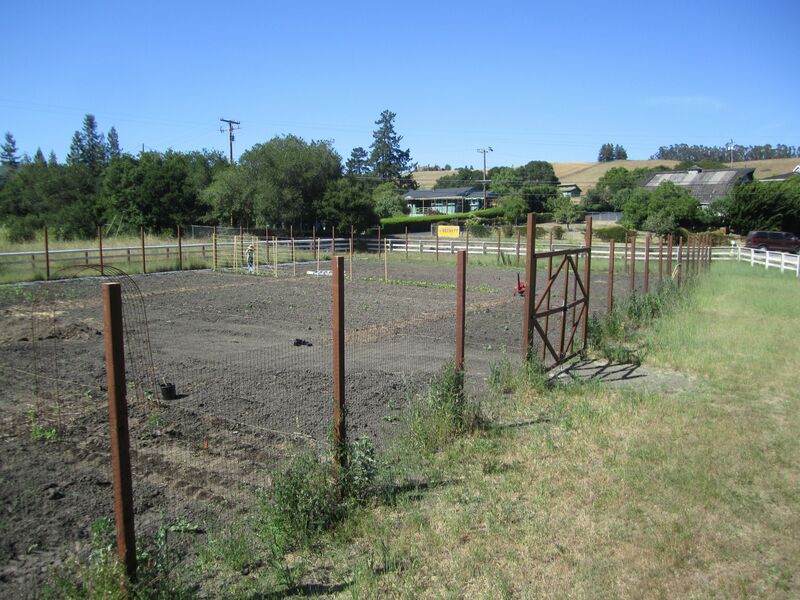 We came out here to “homestead,” after all, and if every book I’ve seen out there on the subject is to be believed, homesteaders rarely, if ever, hire professionals. In fact, hardly a week goes by without those people building a root cellar, digging a duck pond or putting up some kind of yurt. By themselves. The least we can do is build a fence, right? 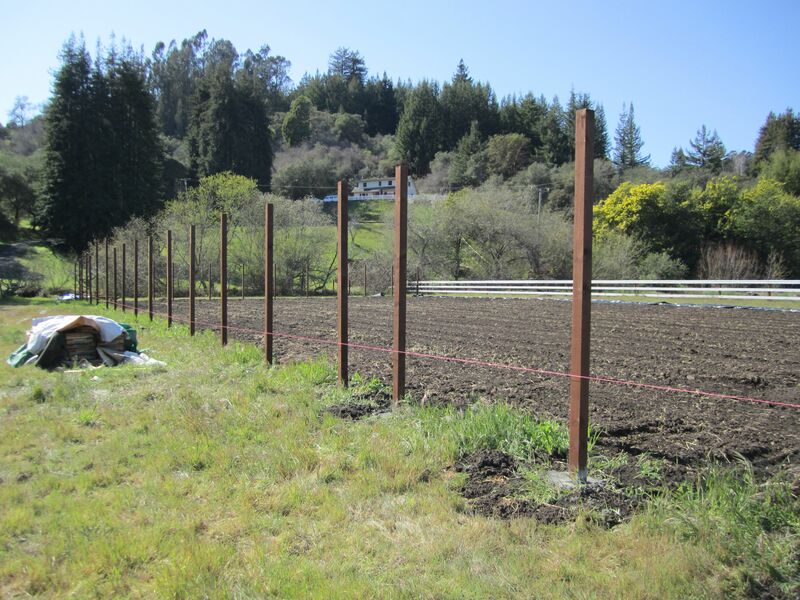 The area we’re fencing is quite large (about a third-acre), and needs to be sturdy in order to keep out deer and any other large animals (this will be our vegetable garden). That means 4×4 pressure-treated uprights, cemented into the ground. 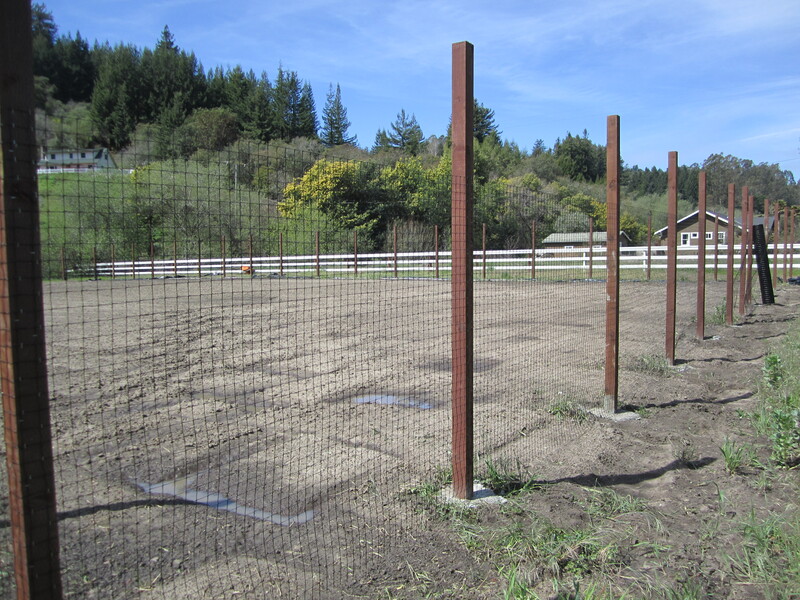 Gates will have to be built, and deer-proof fencing material attached. 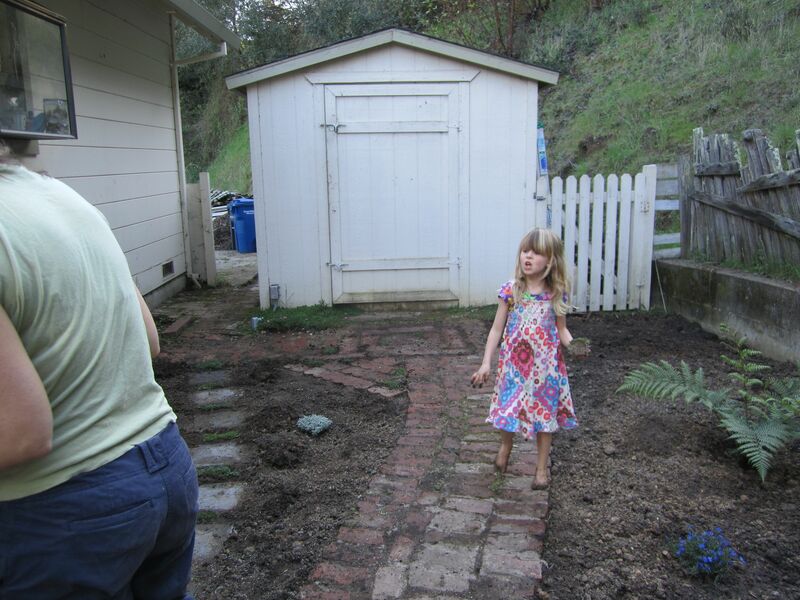 First Lizzy tilled the ground. Then we flagged off the area, spacing most of the uprights at eight feet apart and allowing for one wide gate and two small. We came up with fifty-eight holes to be augured. I ordered the lumber and cement at the local builder’s store. 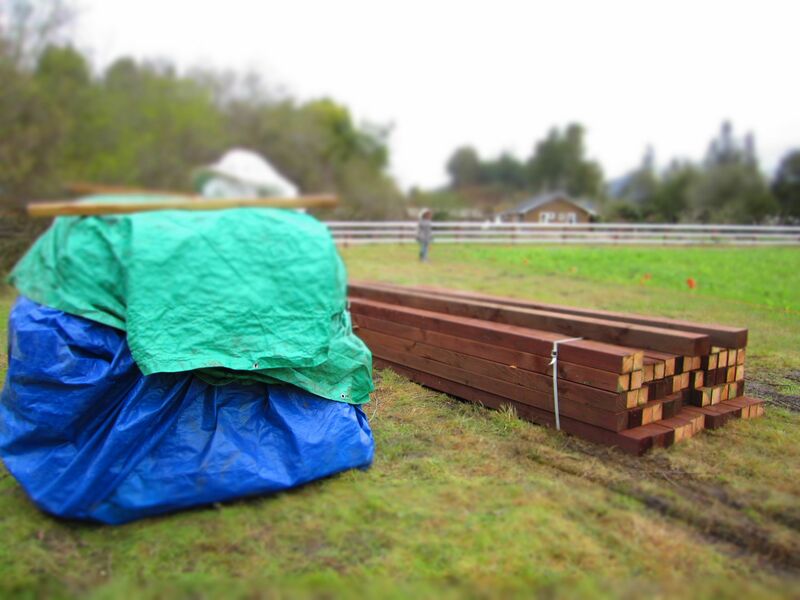 The lumber was easy – fifty-six ten-foot 4x4s, two twelve foot 4x6s (for the main entrance), and a couple extra for good measure. The concrete, though, was a different story. Having never mixed cement before I was thinking, what – one bag per hole? Maybe two? Doesn’t that seem like a lot? Should I order the eighty pound bags, or the sixty? Grudgingly, I ordered a hundred and twenty bags of concrete mix. At eighty lbs. each, that’s a lot of cement. I figured we’d have some left over, but what the heck – we’re bound to use it some day. It was time to start auguring. 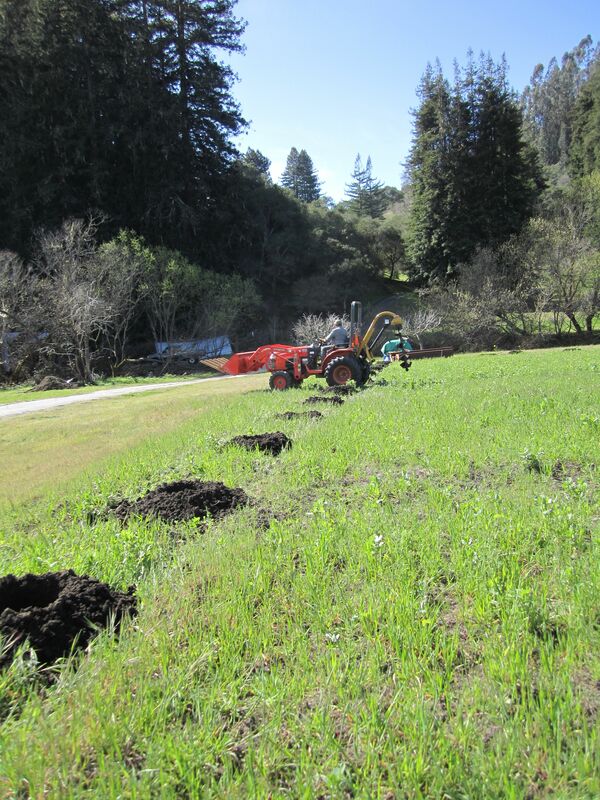 We drilled to a depth of about two feet, allowing for five inches or so of gravel at the bottom. The augur is 12-inch in diameter, more than enough space to secure a 4×4. Before we could start setting the posts each hole had to be prepped. Prepping wasn’t easy, as it entailed cleaning out all the excess dirt from around the rim of the hole, as well as the stuff that never made it out with the initial auguring. 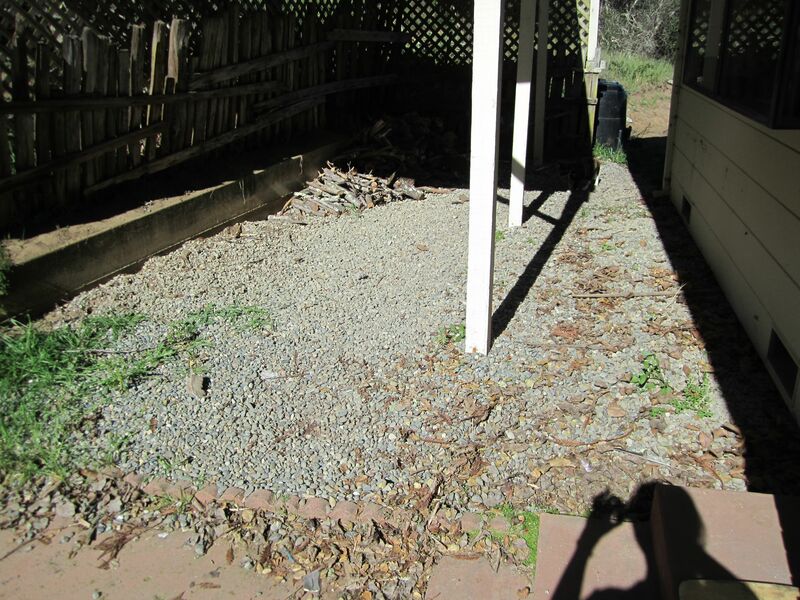 Then, in went the gravel (the gravel, at least, was free – we removed it from the back yard as part of another landscaping project to be blogged about later). 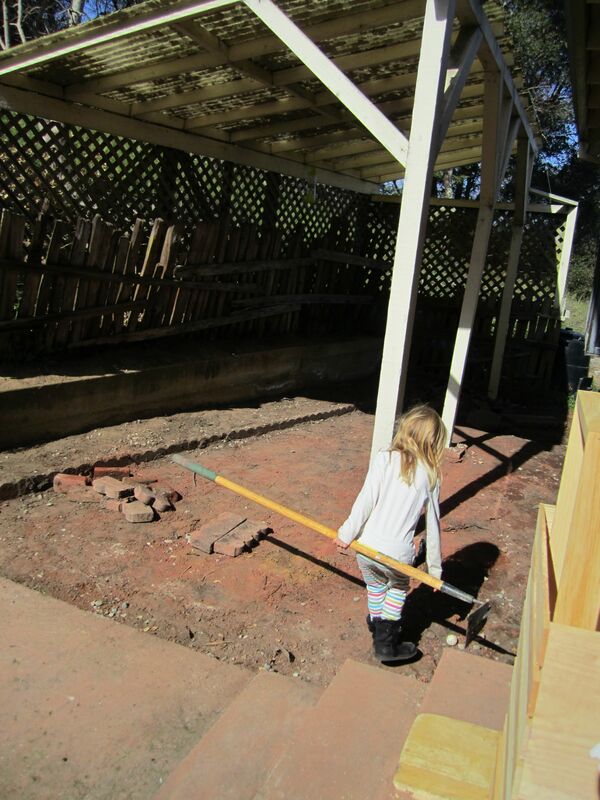 Once the gravel was in, there was eighteen or nineteen inches left for the concrete. The smart thing would have been to complete each stage in its entirety before moving on to the next, but that wasn’t how things turned out. 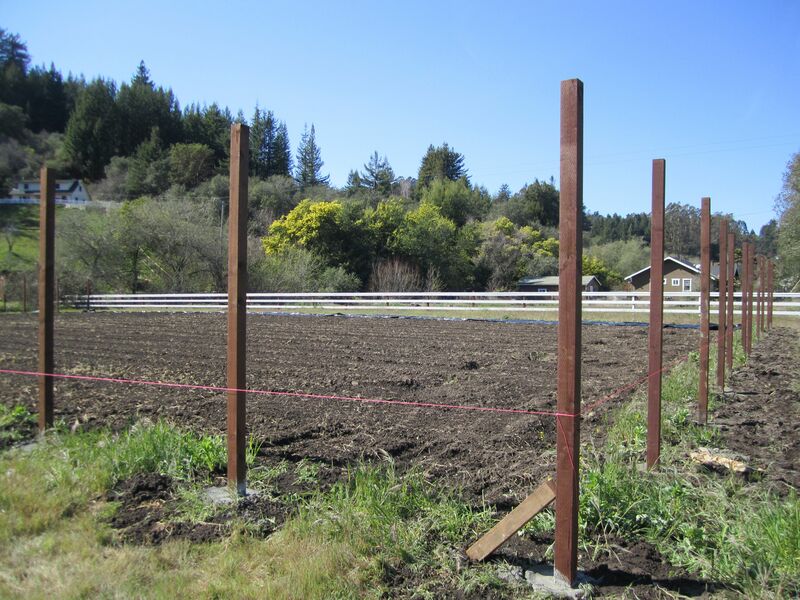 We prepped a handful of holes (which is a lot of physical labor in itself), and then started on the posts, which ensured that the job would be s tretched out over several days. Unfortunately that left the bulk of the holes to be prepped later, which in our case was after it had happened to rain. 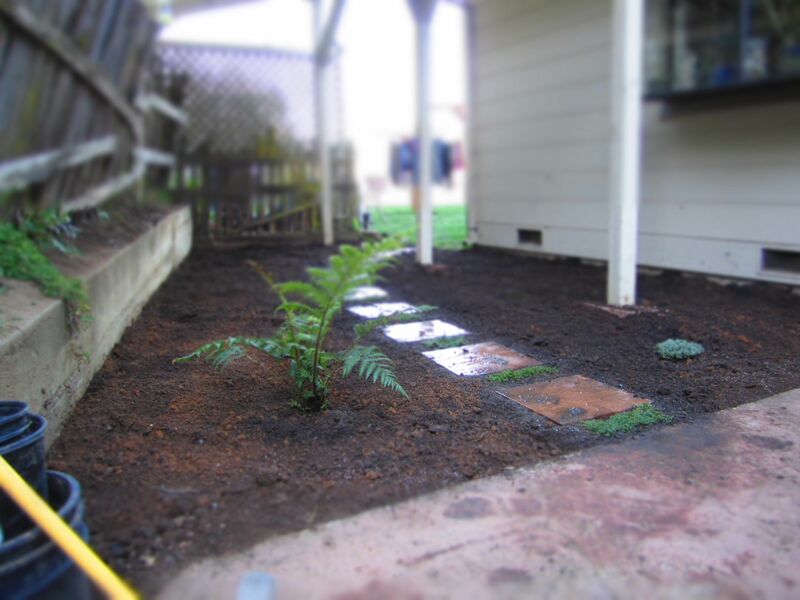 And let me just say that if you’ve never had to scoop out several inches of dense, sticky, clay-like mud from over two-dozen holes in the rain then trust me – it’s nothing to write home about. We were so very lucky to have our neighbors Andy and Dianne lend us both their cement mixer and, for much of the job, Andy himself. He wound up being on board for close to half the posts, and without him I might very well be in a body cast. I’m not lying when I say the amount of labor that went into this process was more than I had counted on. 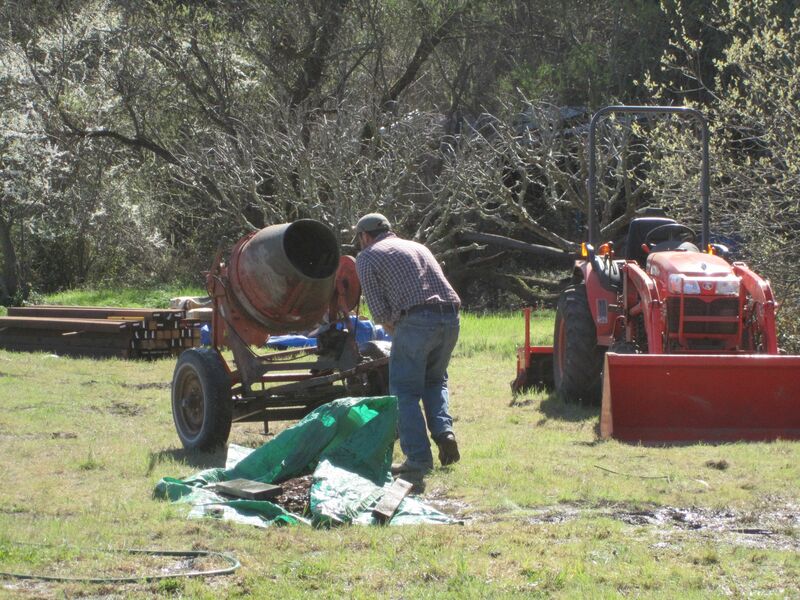 First the cement mixer had to be physically rolled into place each day over bumpy ground (our truck has no ball-hitch). 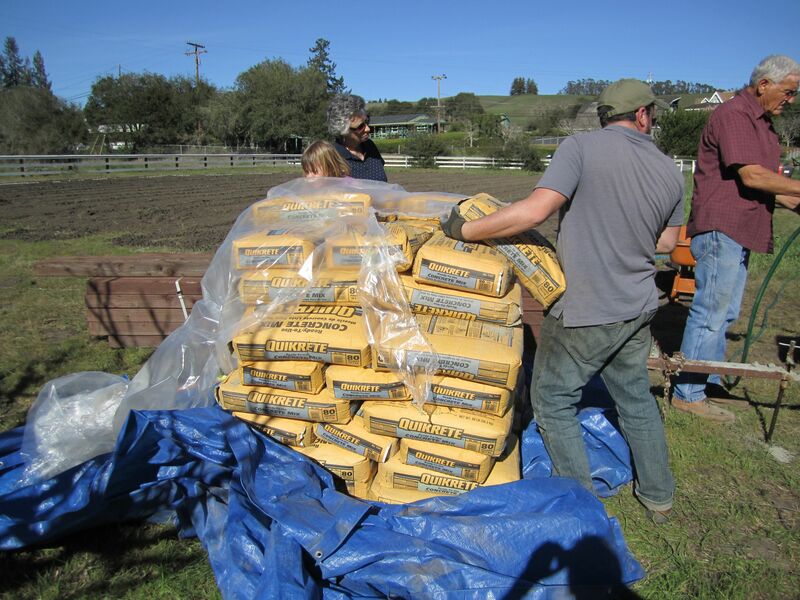 Then the cement, which was staged at one corner of area, had to be loaded into either the truck or the tractor and moved to where we were laying posts. 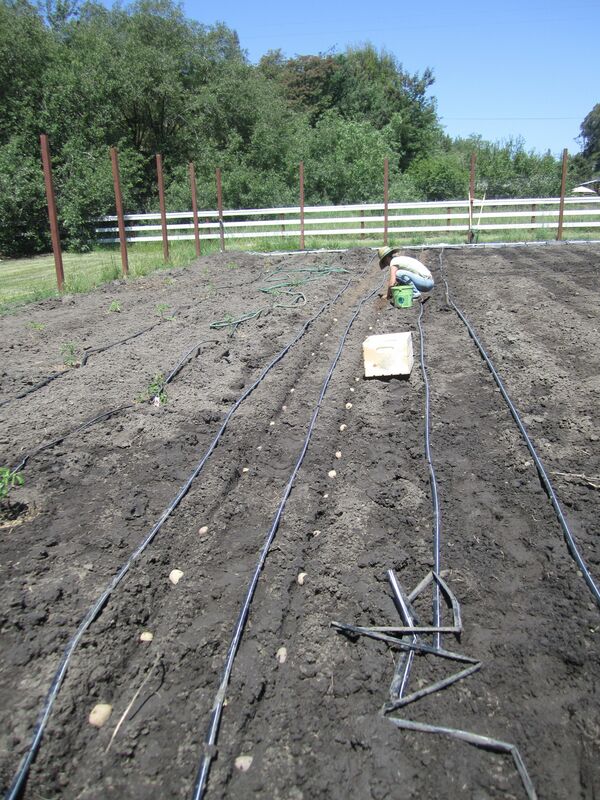 Several hoses had to be connected and run from the nearest water source; extension cords, two or three loooong ones, had to be hooked up. All of this took a lot of trudging and lugging – two things I’ve never been very good at. On the plus side, though, I did find that I excelled at sweating and grunting. One the mixer was up and running I had to tear open the bags and somehow manage to get the contents poured into the spinning mixer without covering myself with, and inhaling, half of the bag. 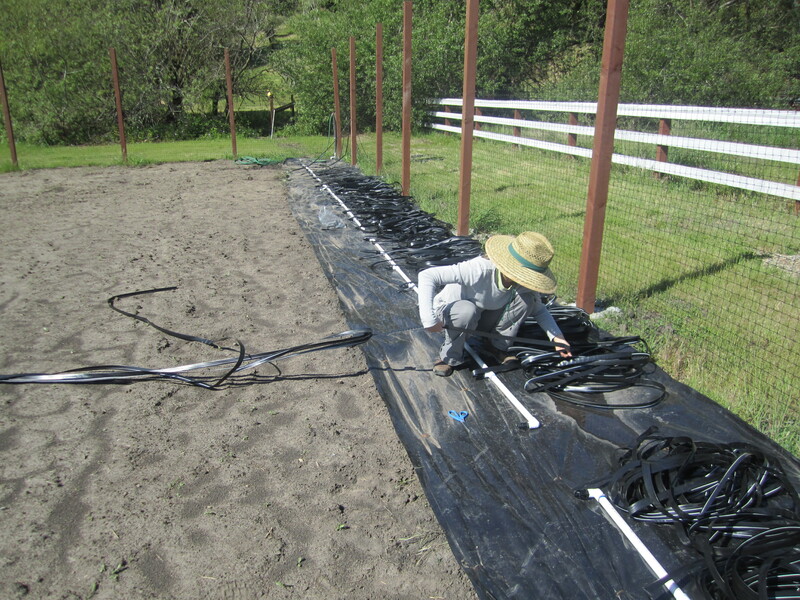 Then I’d give it a healthy dose of water from the hose, then another bag, then more water – you get the picture. 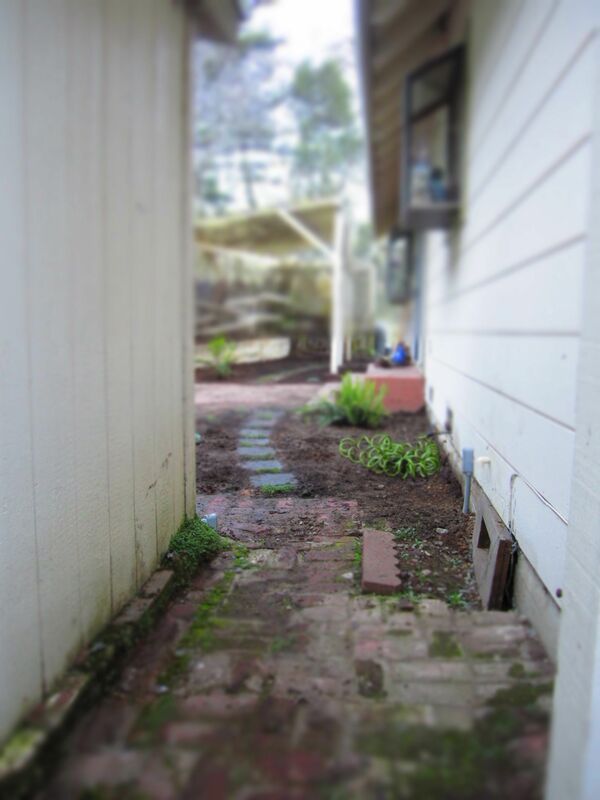 Once the desired consistency was achieved I dumped the wet cement into a wheel barrel, which I then had to navigate over rough terrain several yards to the hole without losing my balance or hitting a divot in the ground and spilling half the stuff. There awaited Lizzy, holding the post in place. 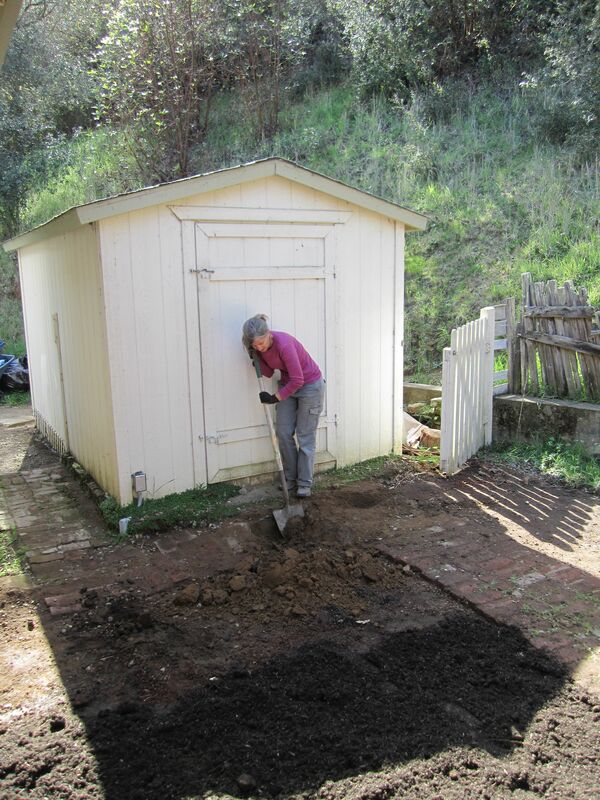 She had to manage to keep the darned thing level while I shoveled the cement into the hole. 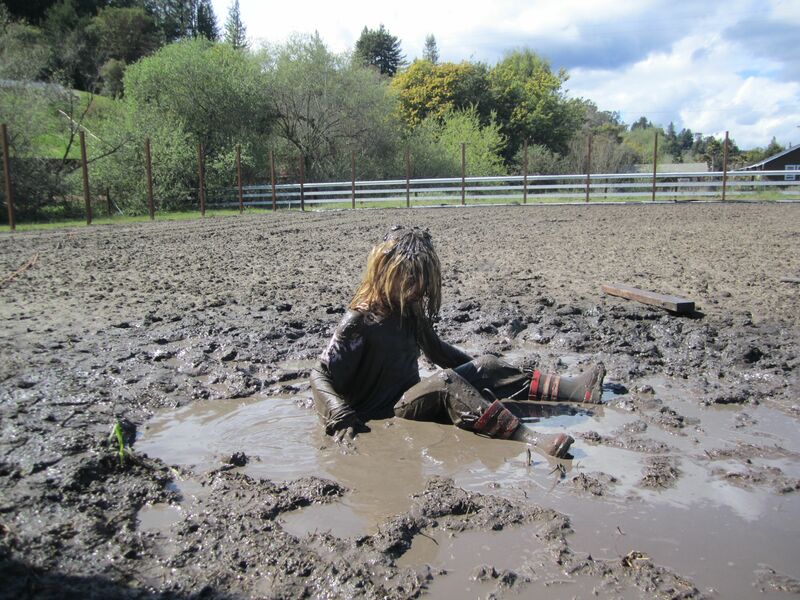 Anyway, I was exhausted, soaking wet, covered in cement, and bleeding – yes, bleeding – by the time we were finished. 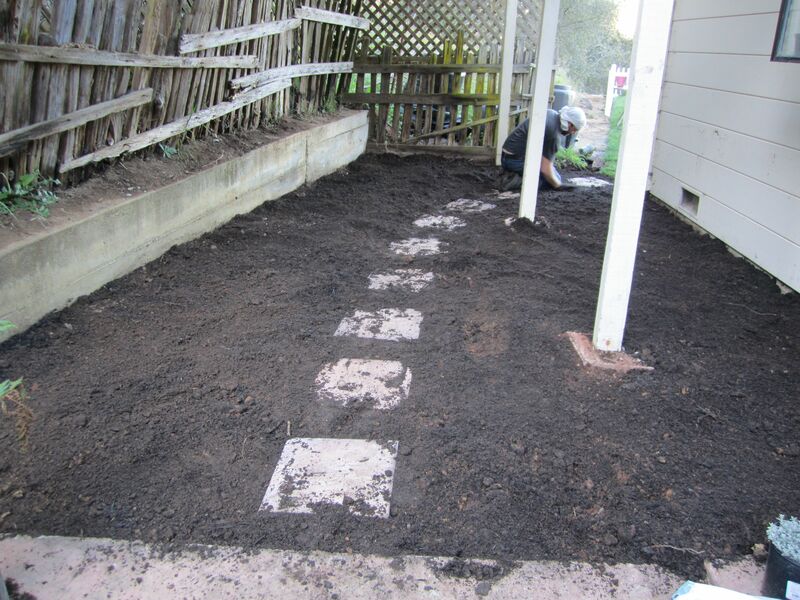 And yes – that single hole required three bags of cement. That’s around two hundred pounds of concrete and a couple gallons of water. So I ordered more cement. All told, we went through about two hundred and twenty bags of the stuff, though I have to admit I opted for the sixty-pound bags, rather than eighty, for the subsequent orders. Trust me – you’d have done the same. We found that we could work only a couple of hours a day before our own physical limitations forced us to give up. That added up to about fifteen posts a day, if we were lucky. But somehow we pulled it off, and just in time – the rain we’re getting now forced us to finish the final seventeen posts in an hour and a half, without our neighbor Andy’s help, this past Monday. I’m only half-way through building the large gate doors, and we haven’t even begun to attach the fencing material, so expect more later. Until then, I’ll be in bed recovering.